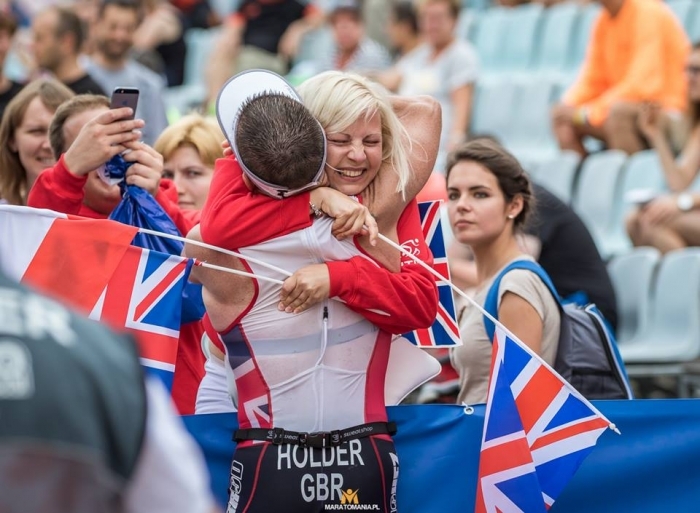 Medals galore this weekend but Rotterdam sees Claire Michel’s “Road to Rio” paved with gold. 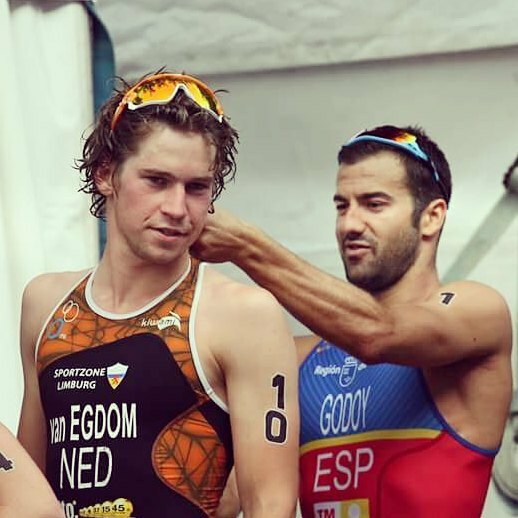 This weekend saw European Triathlon at it very best. 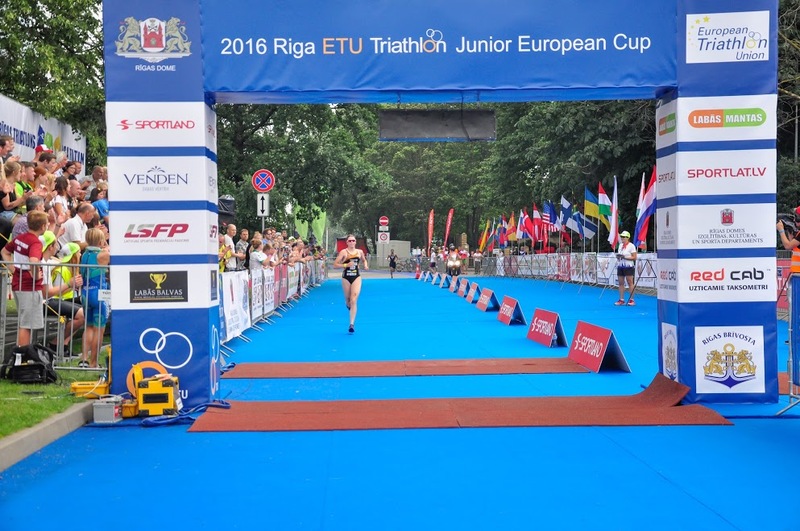 In Riga the Juniors raced the Sprint Distance. 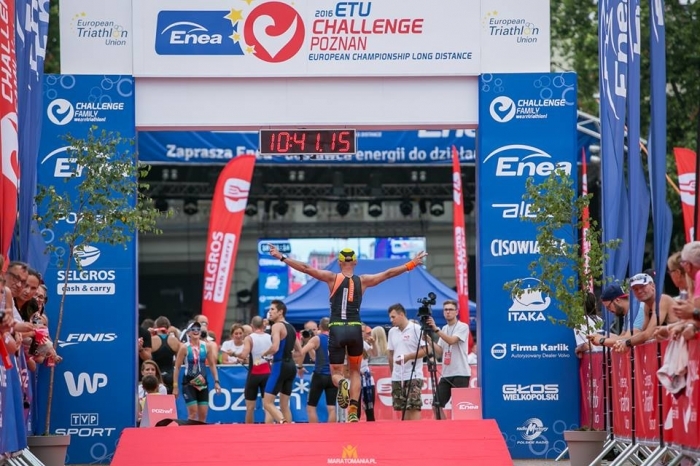 In Rotterdam there was stiff competition amongst the Elite as the Sprint event was used as a final test before Rio but in Poznań the big one saw a very early morning start and for some a very late evening finish with the massive Long Distance ETU Challenge Championships. 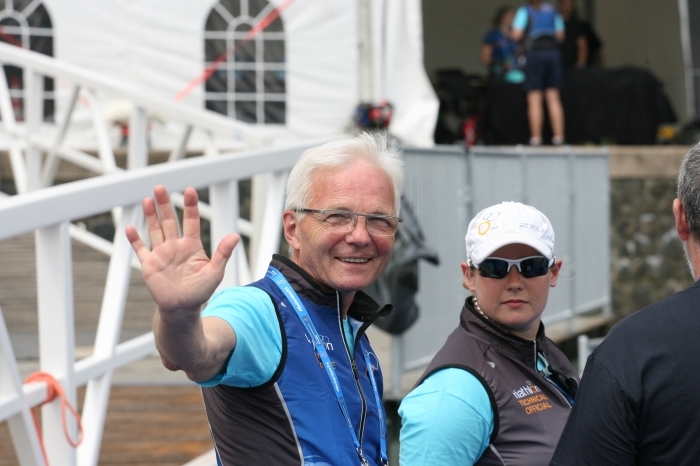 Great support was heard all round the course for the French PT5 athlete, Arnaud Savio and his guide. 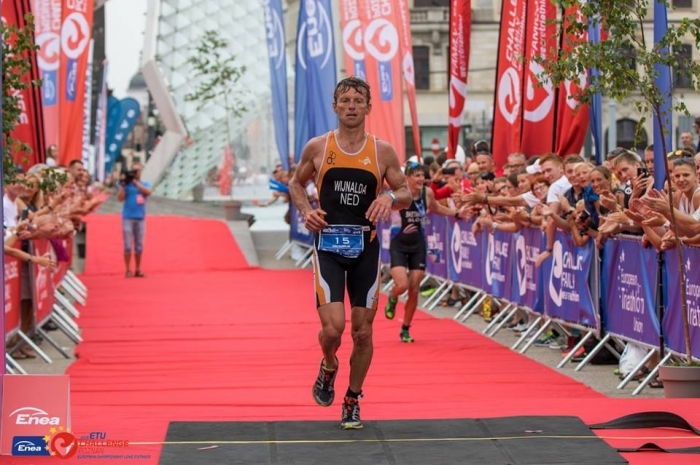 Back to defend his 2015 title gold went once more to France. 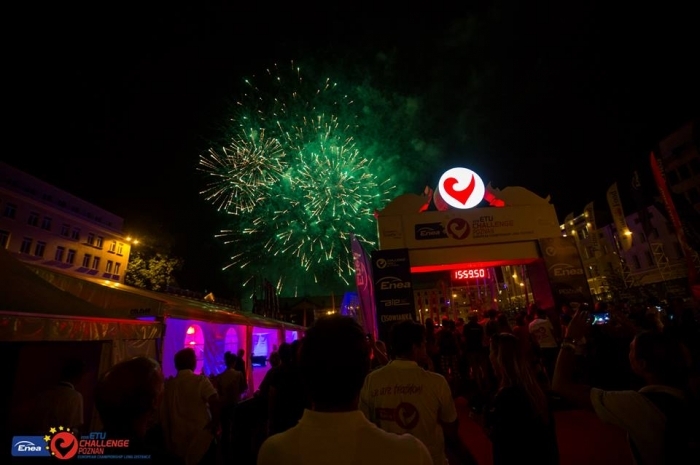 The day ended with fireworks and, despite the long hours of racing for the athletes, the party atmosphere certainly carried on beyond midnight. 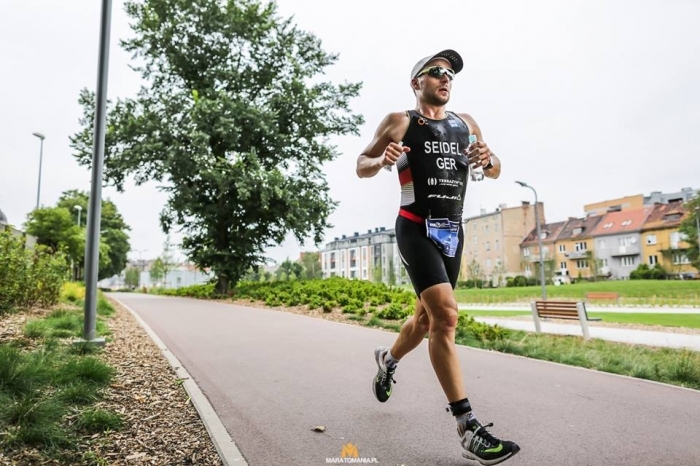 We get to see how the race went, thanks to Pawel Naskrent and the LOC who provided the images. For all photos, videos and comment, please check the event Facebook page. 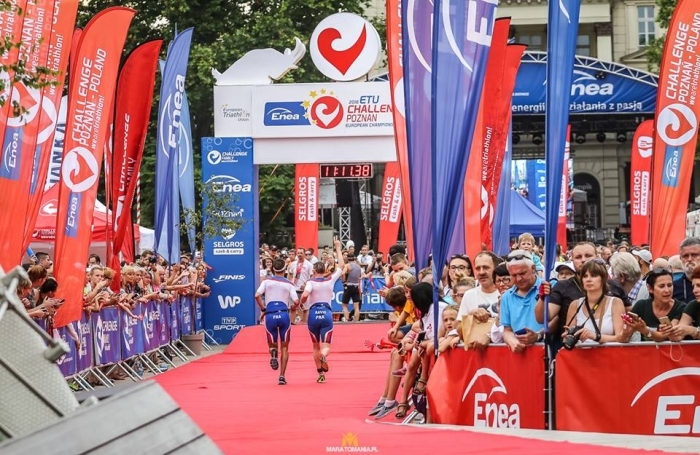 Our usual reports cover sprint and standard distances but on the ETU Race Calendar each year we have the middle and long distance events. 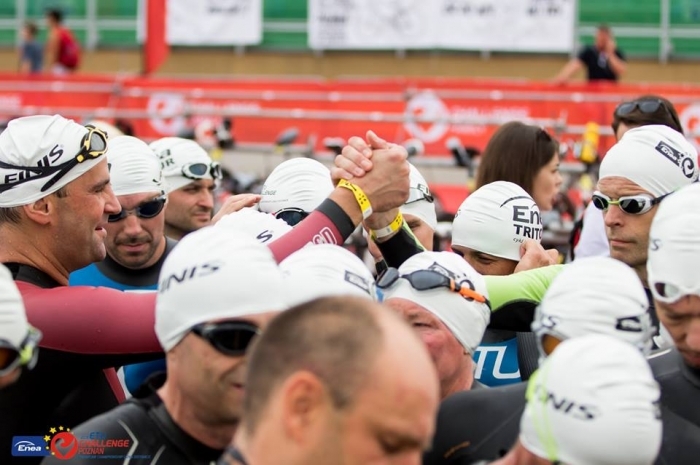 In years gone by athletes would train and train and then compete in a mini-tri. 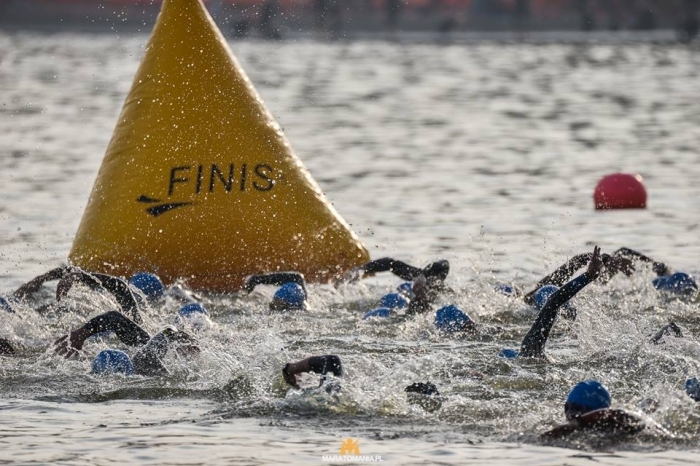 After a few, they would try a sprint-distance before attempting what we used to call an “Olympic Distance” race. After a few of them we might try a middle distance before, with much trepidation, we “went long”. 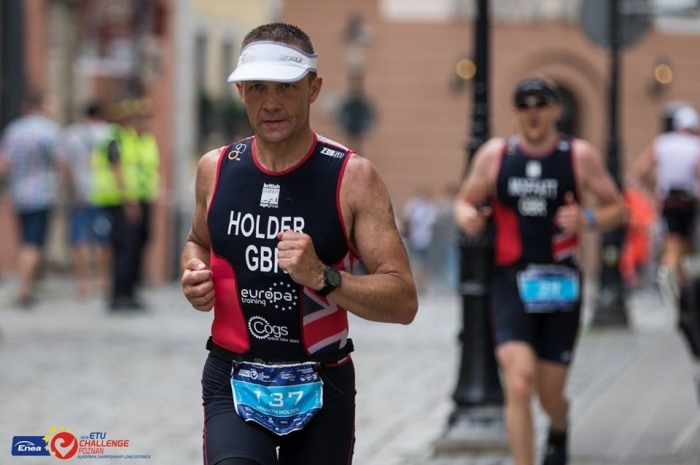 By so doing we would prepare our bodies for the truly massive challenge of the long-distance event and along the way we would be contributing to the development of sport in our own country by racing at numerous events. By the time we got to the start line of the “Big One” we were ready. In Great Britain this was most certainly the case and in part this has helped the development of Age Group Racing for Team GB. 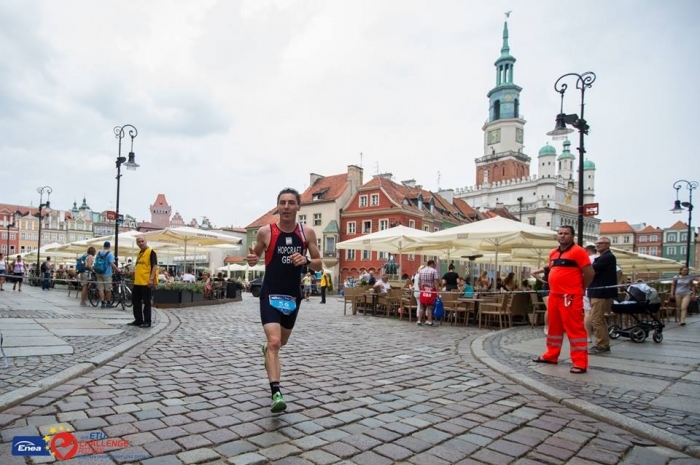 Poland is an easy to get to location either by plane or by car or train and so once again it was no surprise to see Team GB in large numbers. 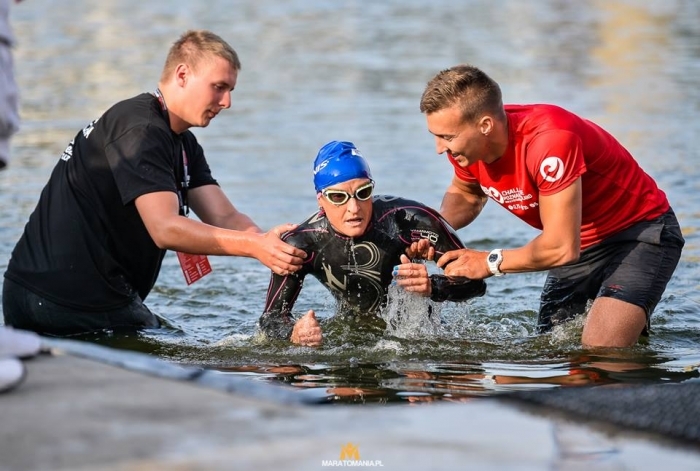 In recent years this approach has changed and for some who stood in their wetsuits at the start, this was going to be a journey into the unknown. Perhaps they had “done the distance” in their training sessions. Today would be the test. For the Elite, however, they knew that commitment to such a distance had to be complete. 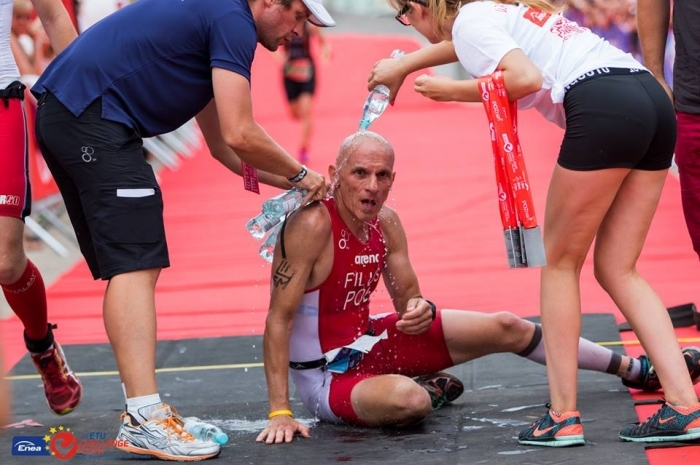 For the Elite, they knew that their finely-tuned bodies could so easily let them down if their preparation had not been 100%. 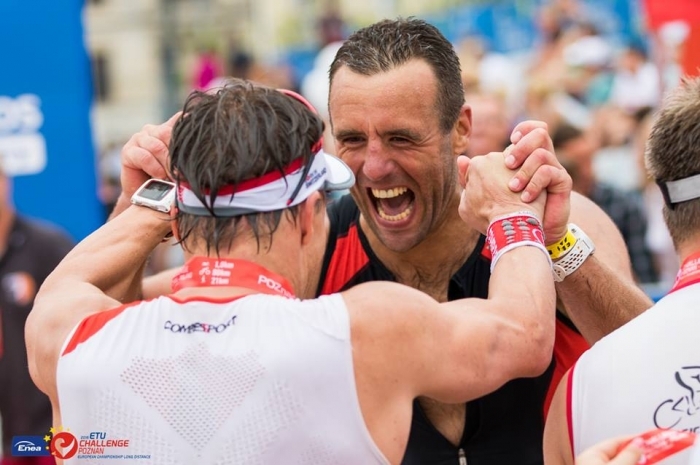 For the Elite, they were racing for prize-money, titles and glory. 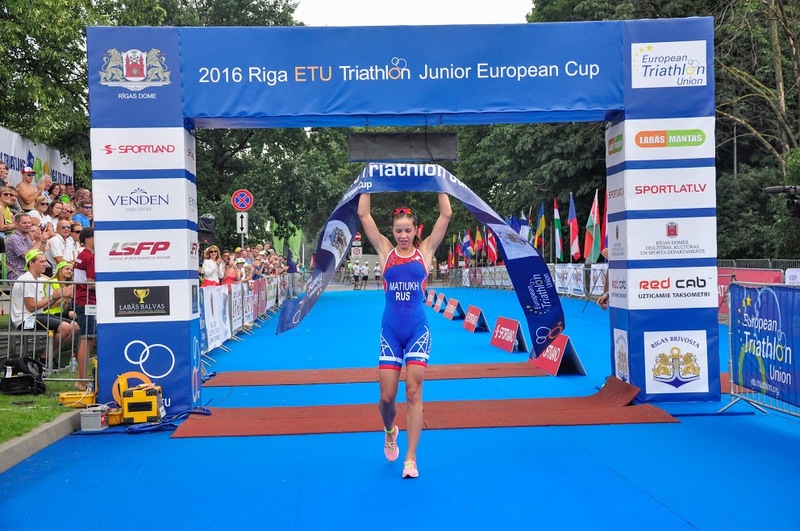 First out of the water for the Elite Women was Ewa Bugdoł. Not only is she Polish but also came to the race as favourite with a 2015 world title from Weihai. 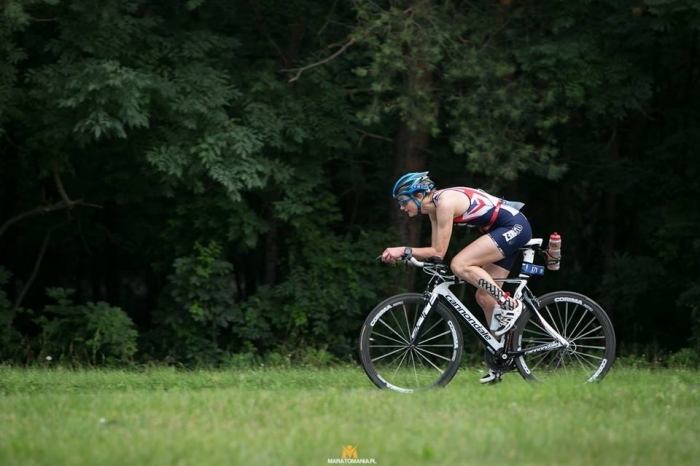 90 seconds ahead of her nearest challenger, her T1 was slick and then she was out onto the bike. 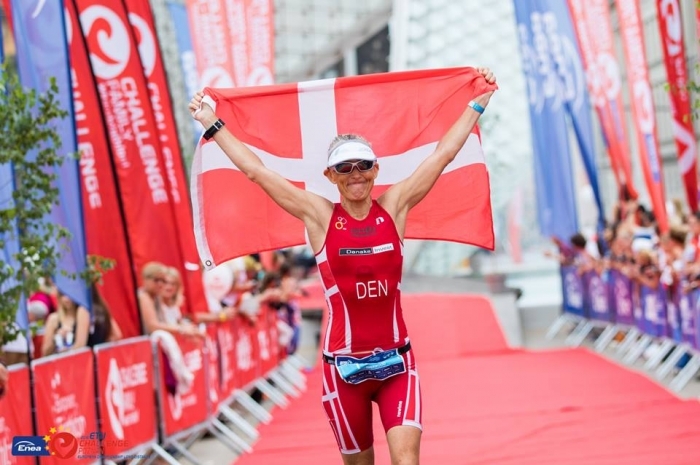 It was here that the Danish threat was visible as a six minute advantage that Bugdoł had created on the swim was eaten into, chewed up and spat out as Anne Jensen’s powerful riding took her into the lead. 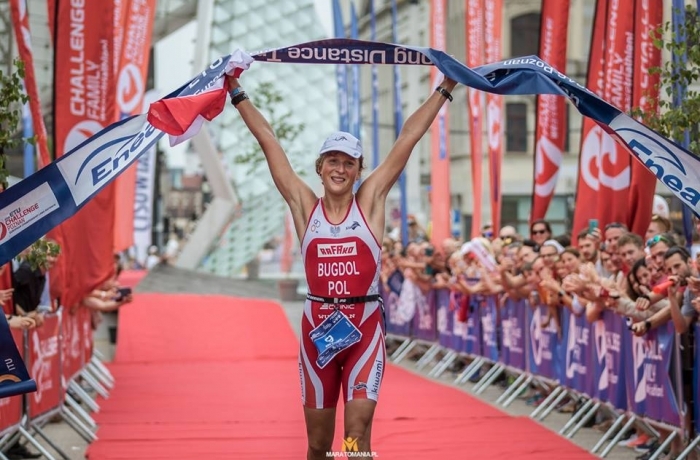 The Polish crowds that lined the run course gave all their support to Bugdoł willing her to claw back the lead and ultimately her run pace was enough to edge back to the gold position but fast running was bringing Simona Křivánková into contention. 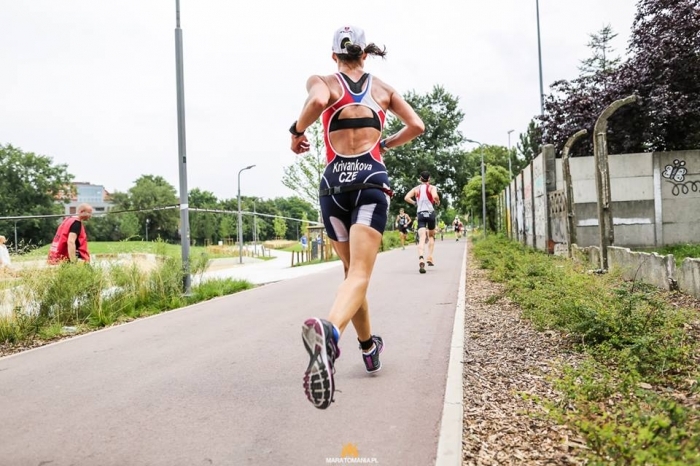 She was running like the wind and passing many athletes on her way to the podium but just which medal she would collect was not clear until close to the end. 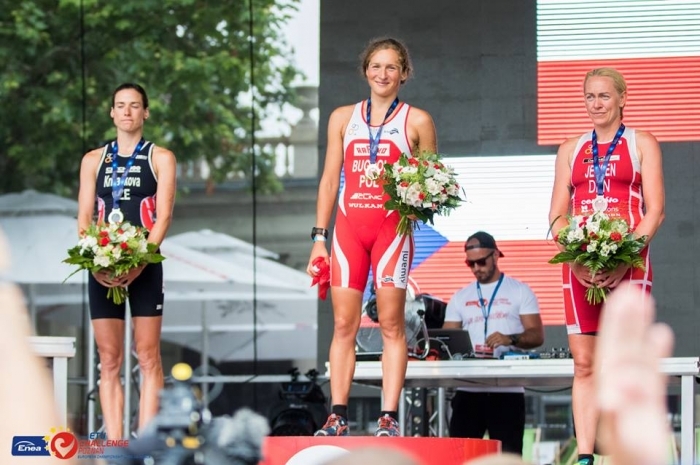 The Czech’s bike split was significantly down on the leading Polish and Danish athletes but once she had her running shoes on she flew. Sailing past Jensen she now had Bugdoł in her sights but sadly, just ran out of running course. 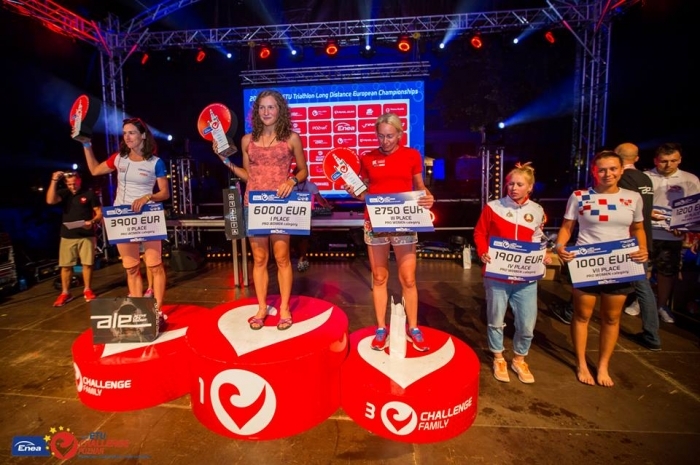 With another 5k she may well have taken the lead but the final medal positions gave gold to Poland, silver to the Czech Republic and bronze to Denmark. 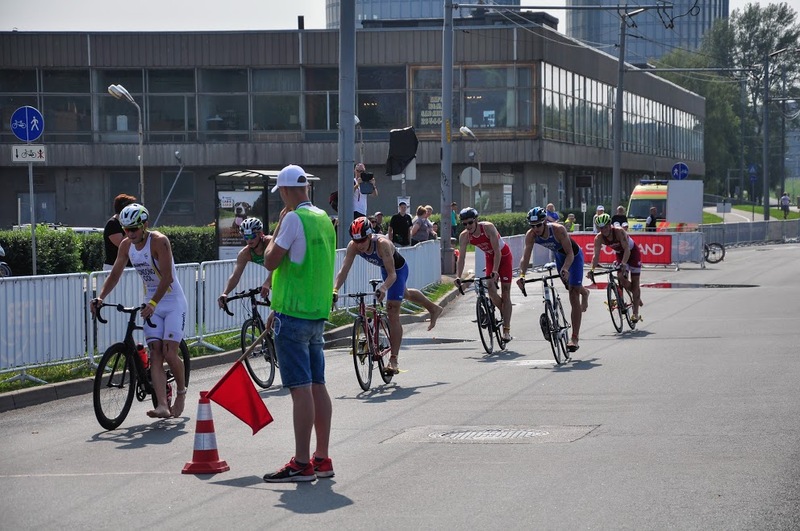 The Elite Men were close in the swim, with Georgy Kaurov RUS leading them out onto dry land. 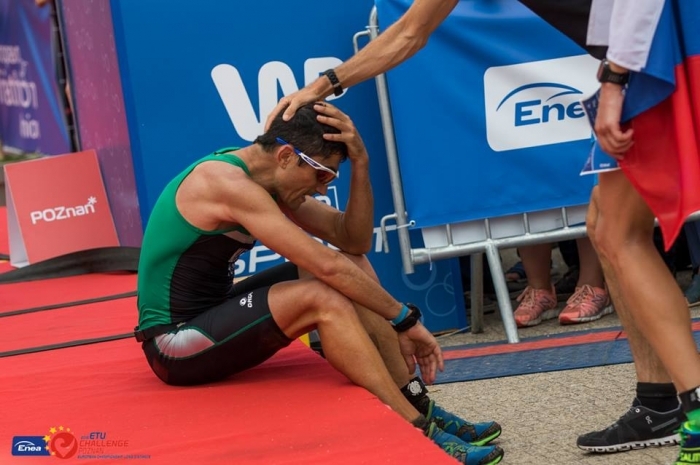 Behind him and close succession came Grigoris Souvatzoglou GRE, Andrey Lyatskiy RUS and from Belarus Anton Blokhin but none were to feature in the medals. 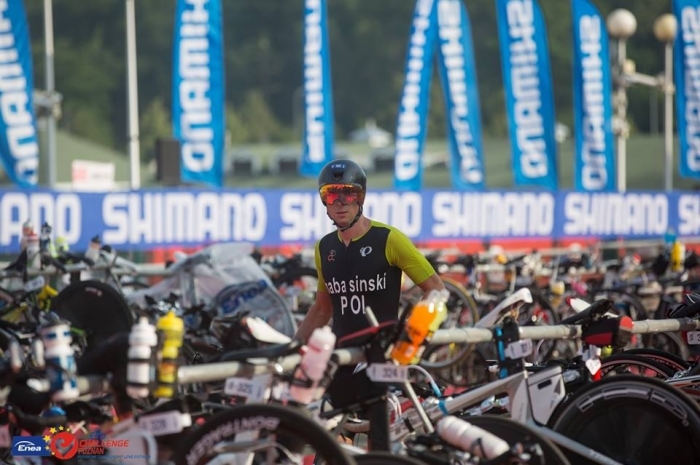 The 180k bike would see huge changes in the lead. 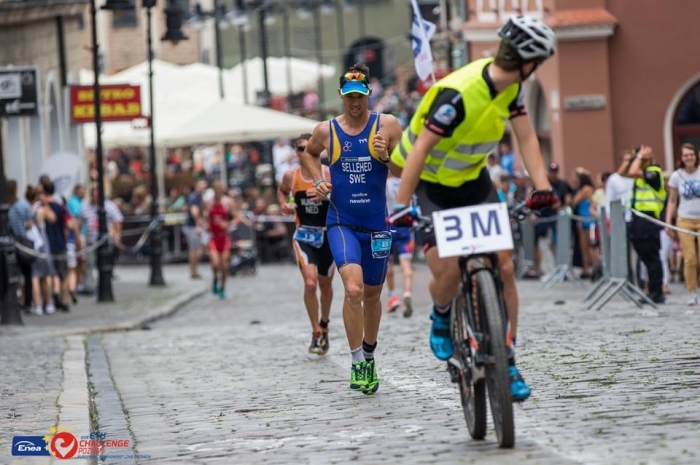 Dutchman Dirk Wijnalda, Anders Christensen from Denmark, Slovenia’s Denis Šketako and Sergio Marques from Portugal were riding hard and soon the balance had changed. Marques was able to post the fastest run split of 2:48:30. 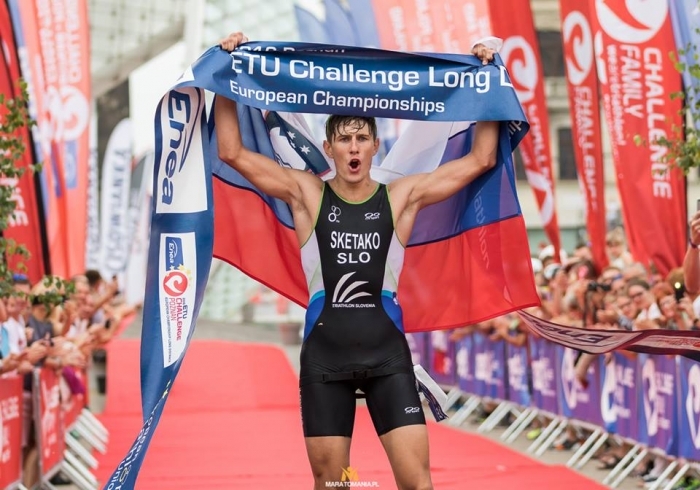 Impressive for a 42k run but sadly for him, the work had been done by Šketako and it was the Slovenian who took gold and the title. Third place went to Wijnalda. Šketako was jubilant after the race and medal ceremony, “What can I say, today is payment day. I have become European Long Distance Triathlon Champion. My dreams are coming true. 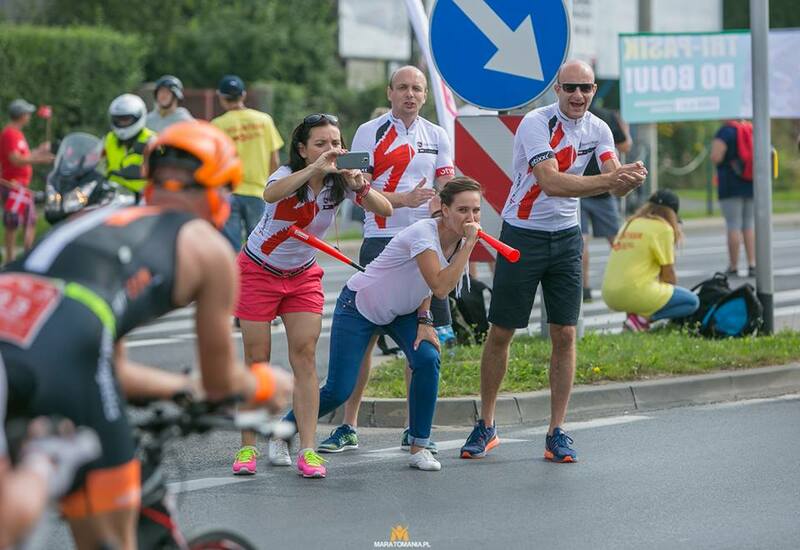 The national anthem was being played to me ;) I want to thank to each one of you guys, that you are a part of this dreams!” Kaj naj rečem, danes je dan plačila. 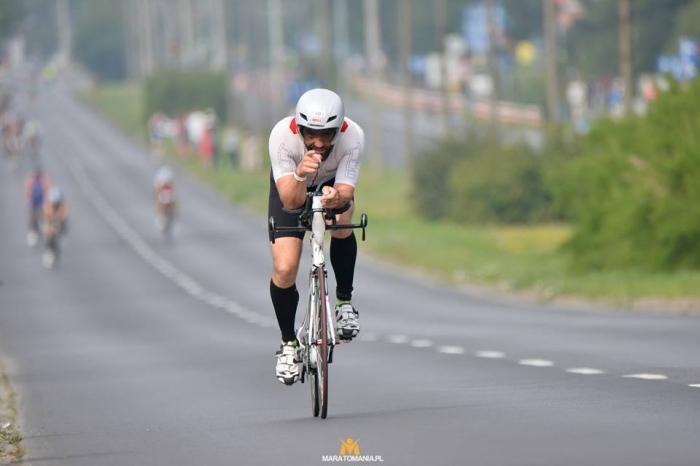 Postal sem Evropski prvak v dolgem triatlonu. Moje sanje se uresničujejo, igrala mi je himna :) Hvala vsakemu posebej, da ste del njih! 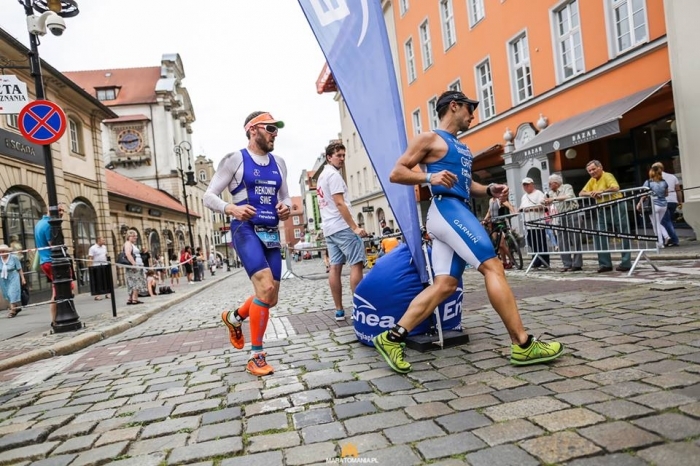 The city of Poznań welcomed athletes who would be racing all distances at their triathlon festival but the welcome for the Age Group athletes who filled the city with colour and triathlon-enthusiasm was the warmest. 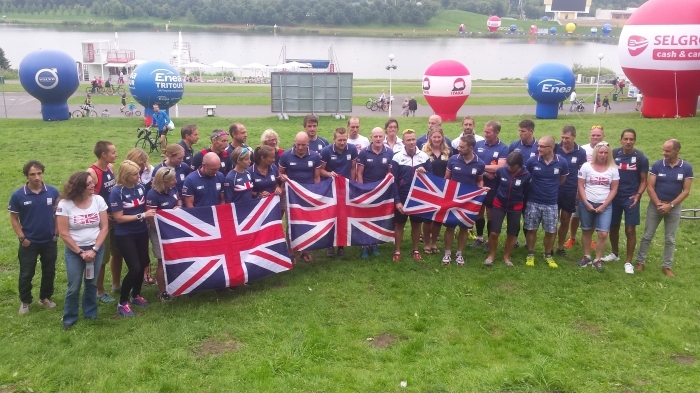 Team GB was very visual but would they, just with large numbers, take home medals over this more challenging distance? The Polish home team would be out in force and would have the vocal support of the many spectators who lined the course and the German team had some strong distance specialists who would certainly be on the podium. 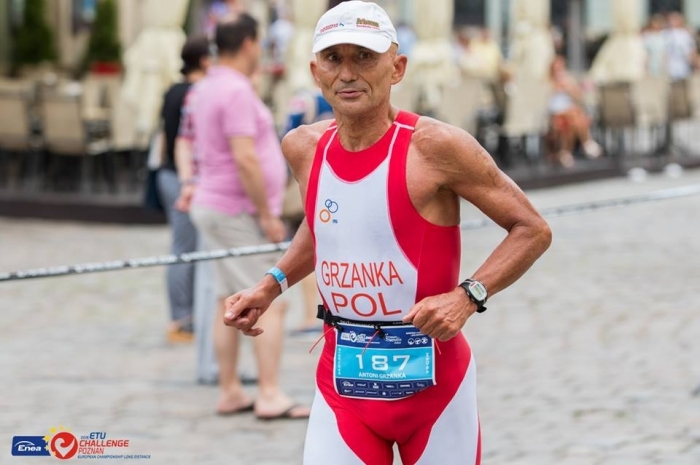 With 15 national federations sending their long-distance athletes, it was a spectacular sight with national uniforms being worn with great pride. 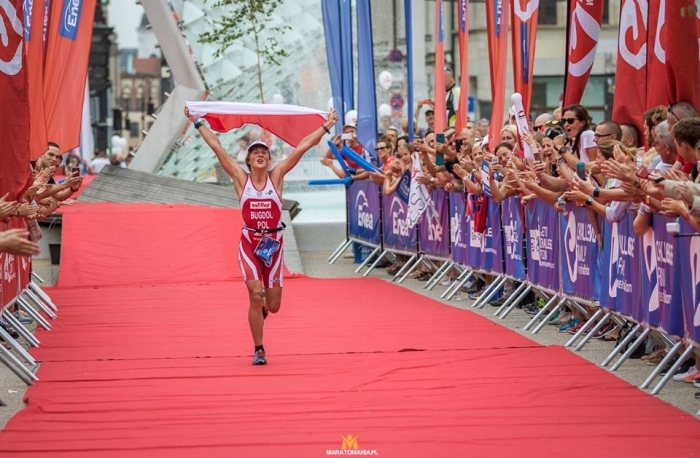 Outstanding performances came from many but we can single out Switzerland’s Tamara Larizza for her victory in the 35-39 category. 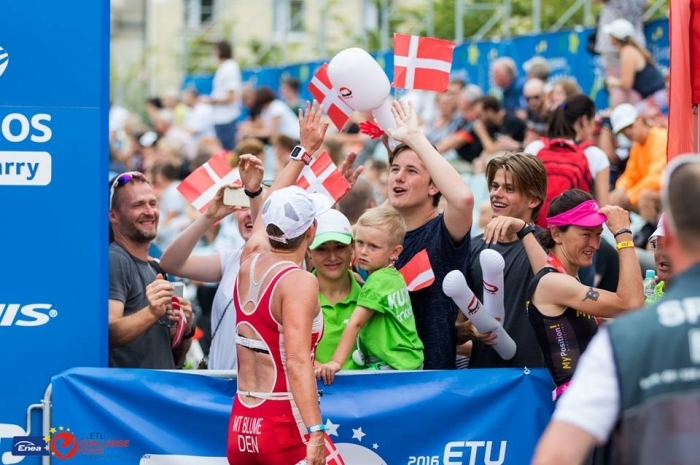 The Swiss athlete convincingly took her title in 2014 in the heat of Paguera in the ETU Challenge Championships and once again she took the title but it was not an easy victory for her as she had to play catch up from the start. 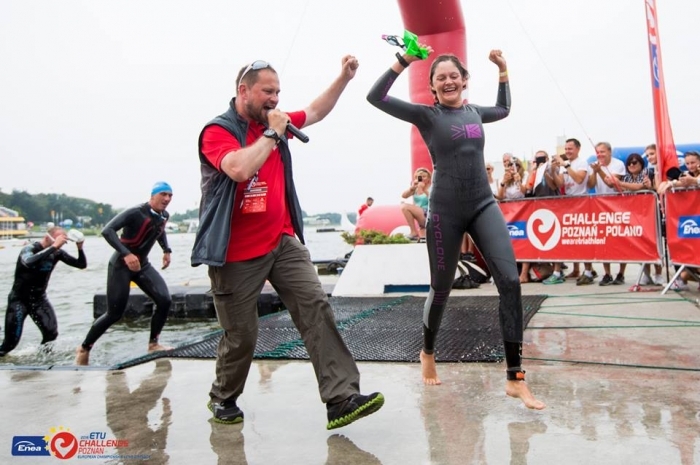 It was Kylie Mansfield, gold winner from Weymouth, who led out of the water comfortably ahead of all the others in that category. Almost ten minutes behind her was Larizza whose bike split, at over 15 minutes faster than Mansfield, took her ahead and then it was all out on the run. 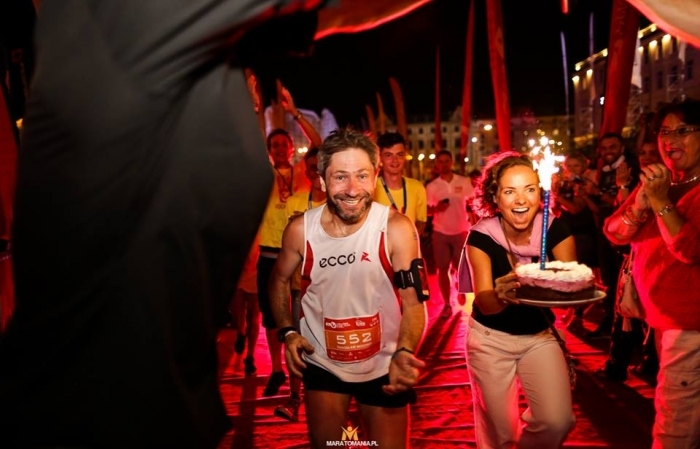 With a 3:21 marathon to finish, Larizza’s pace was over ten minutes ahead of the others and she took gold once more. 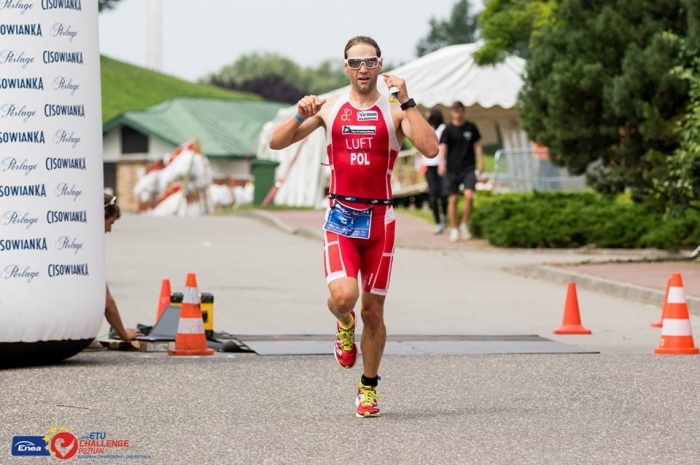 For the men, the fastest time of the day went to Czech Republic’s Jan Wainer. 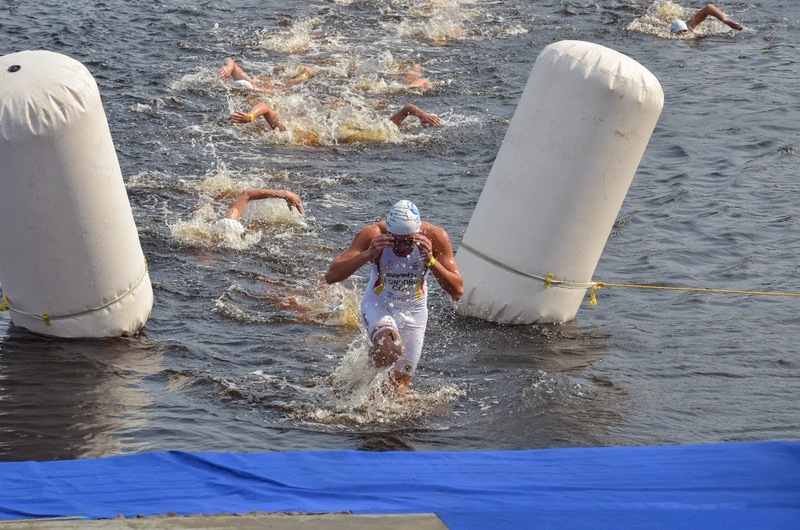 From the moment he hit the water, he was in command with a 42:50 swim that established a solid lead. He built upon this on the bike and it was only once out on the run that anyone had a chance of catching him. The work he had done in the first two legs secured him the 40-44 title. It was in the category that we had the closest finish of the day with a thrilling race to the line from Stamatis Romas GRE. 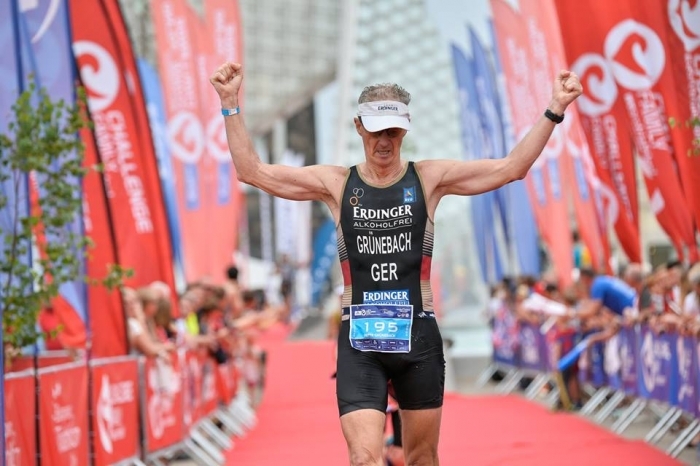 He is no stranger to long distance tests and has featured in the results from Zofingen, truly the ultimate duathlon test. 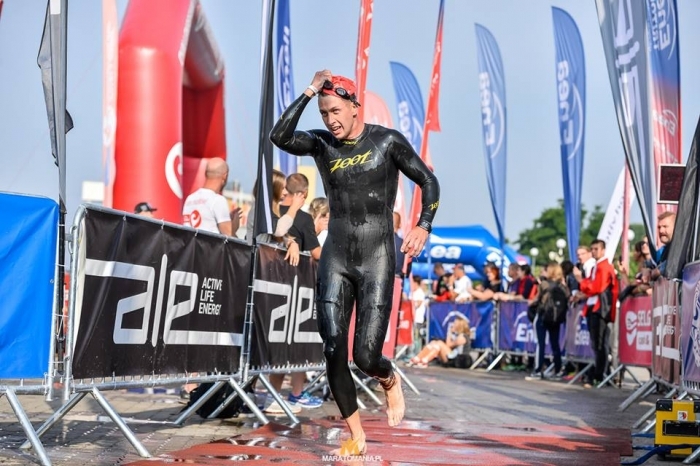 But here, with the addition of the swim, he would bring great excitement to the finish as he chased down Jamie Hendrie GBR. 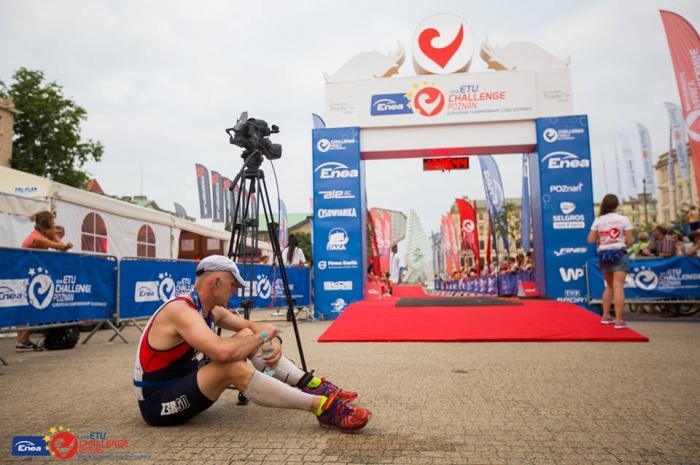 It was Hendrie whose power on the bike took him ahead of the Greek but with great run pace over the final 42k, when they hit the finish line only on second separated them and it was ultimately the British athlete who, coming 4th, just missed out on a medal. 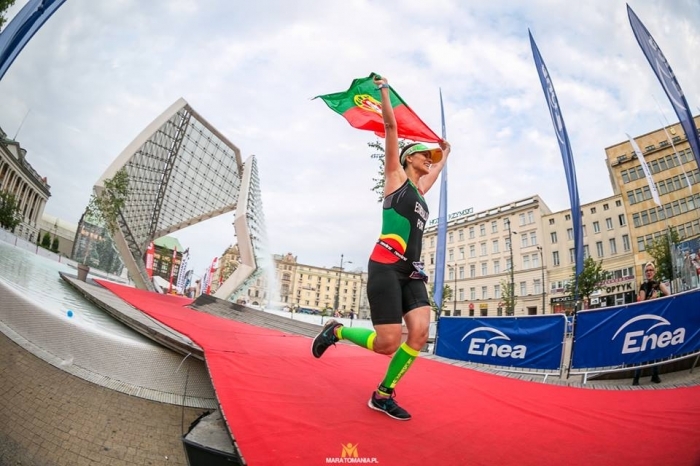 Romas, despite losing out in the final sprint, was thrilled with is performance, “The priceless value of a finishers’ medal and when this is a medal from the European Championship distance triathlon (ETU CHALLENGE POZNAN) and accompanied by a fifth position in Europe in my age group, and in a time of less than 10 hours (9:34:15) in my first participation! 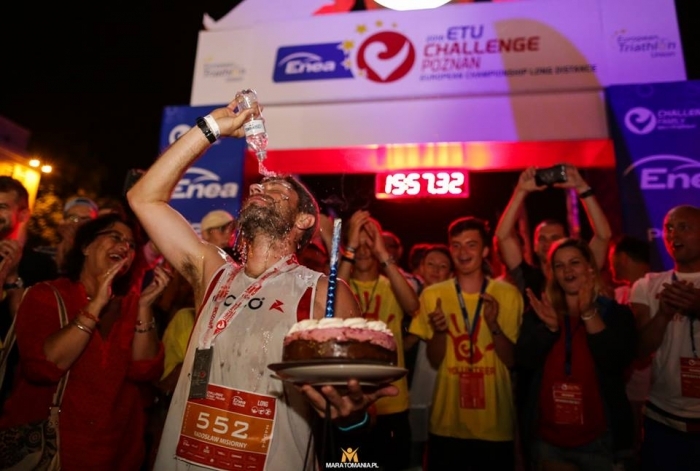 I thank you all for your love and positive energy you gave me during the race!” Αξια ανεκτιμητη παντα το μεταλιο ενος τερματισμου, ποσο μαλιστα οταν αυτο ειναι απο Πανευρωπαικο πρωταθλημα μεγαλης αποστασης τριαθλου (ETU CHALLENGE POZNAN) και συνοδευεται απο μια 5η θεση στην Ευρωπη στην ηλικιακη μου κατηγορια, και με χρονο κατω απο 10 ωρες (9:34:15) στη πρωτη μου συμμετοχη! Σας ευχαριστω ολους σας για την αγαπη σας και τη θετικη ενεργεια που μου δωσατε κατα τη διαρκεια του αγωνα και οχι μονο! 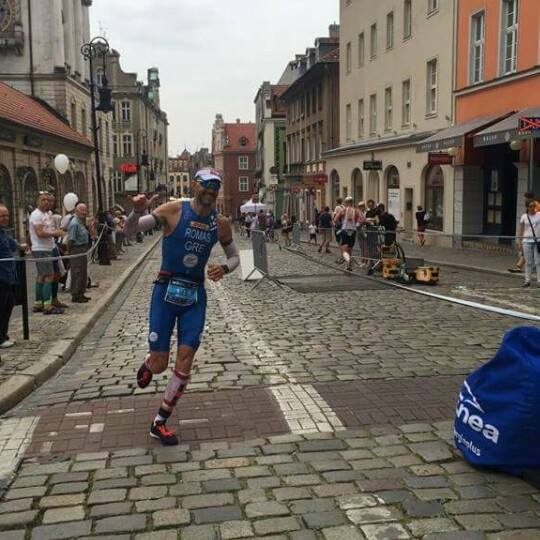 Fast running came also from Marek Kowalczyk POL. 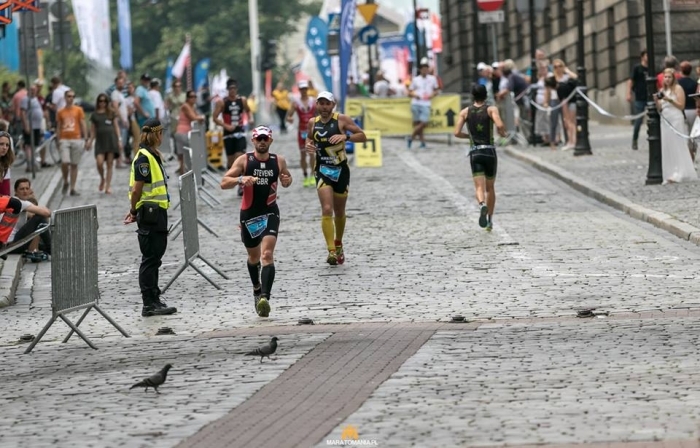 His 3:07 marathon was enough to secure his title in the 35-39 category. 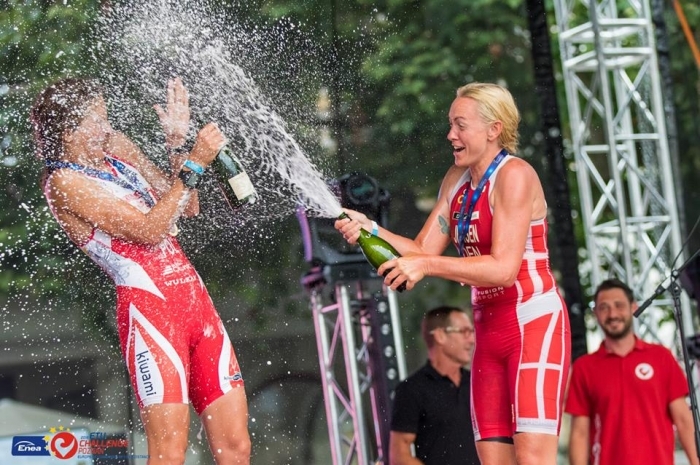 Of all the wins, it was Denmark’s Kim Isherwood who, with an incredible history of podiums, who nailed it. 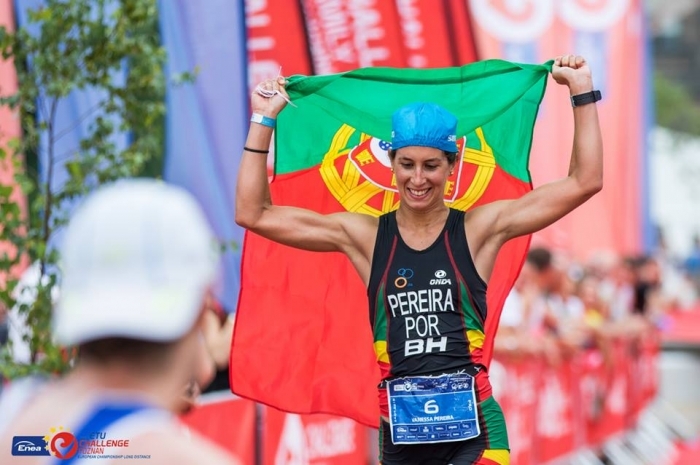 Her victory in the 55-59 category was 72 minutes ahead of her nearest rival. 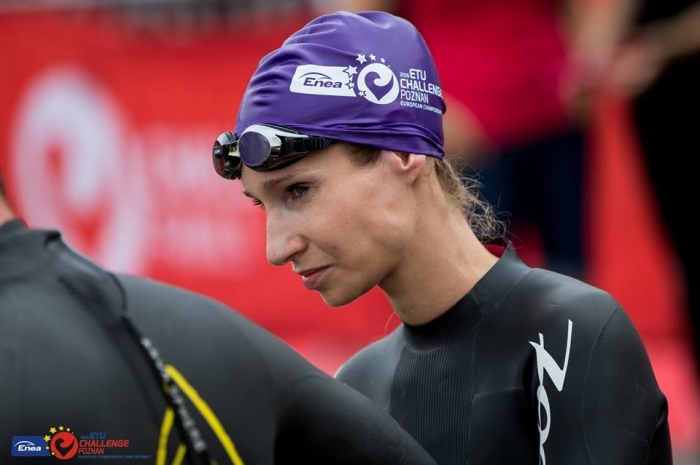 After the race, her motivation became apparent, “In honour of yet another hero lost to us this year. For Dad”. 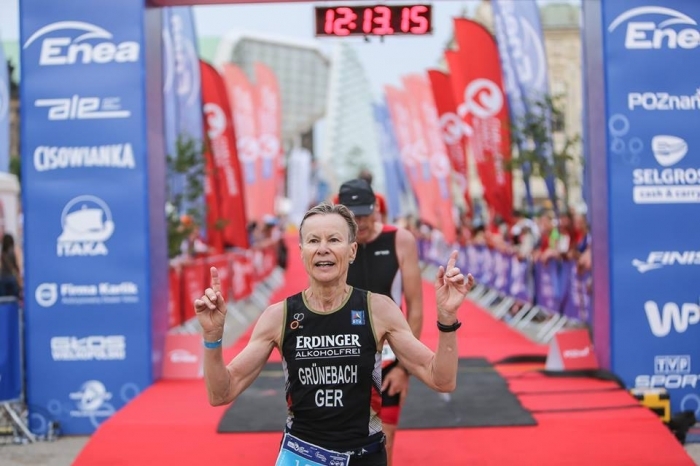 For Germany, the golden couple once more were racing. 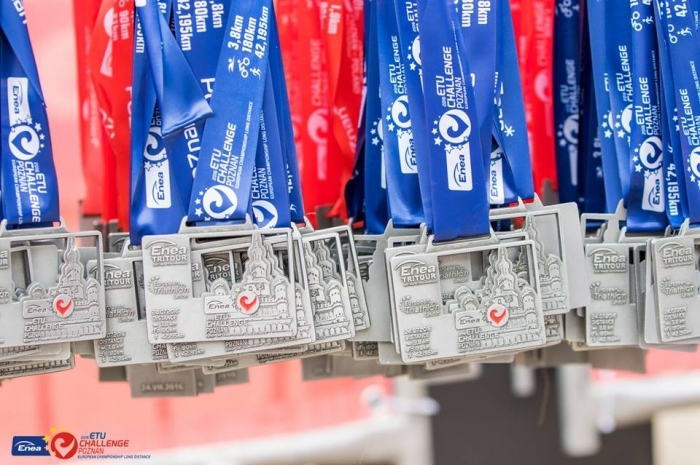 For many years now we have seen their solid support for Winter Triathlon and long distance events. 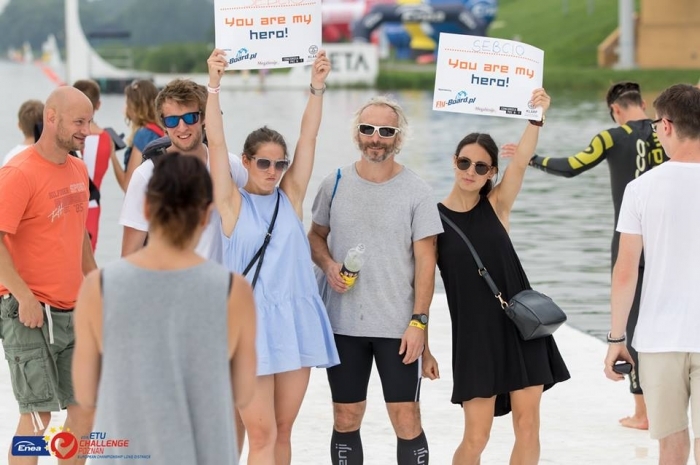 Marianne and Hans-Peter Grünebach came to Poznań not only to race but also, on race day itself, to celebrate their wedding anniversary. 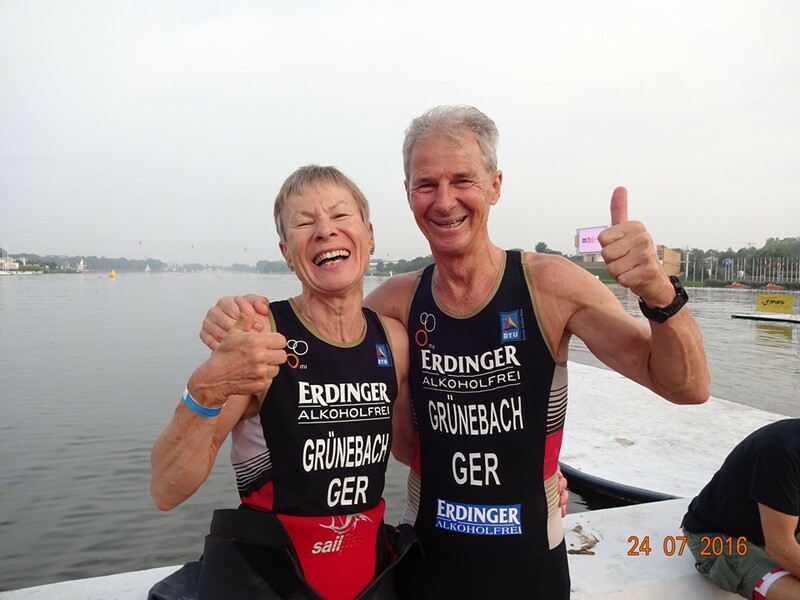 36 years together as husband and wife traditionally means a gift of fine bone china but the Grünebachs had another idea and instead they celebrated with gold. Typically they did not cross the finish line and leave. 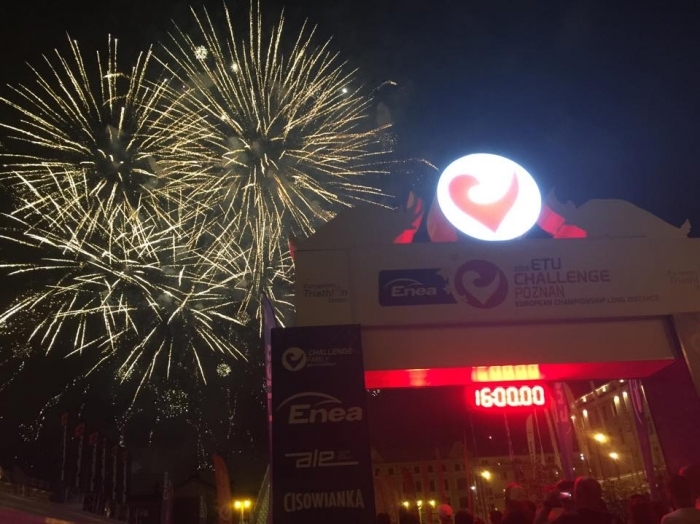 Instead they remained to see the last athlete cross the line, “We came back to the Hotel on Sunday, 2 o’clock after the great fire-works and medal-ceremony at the Freedom Square downtown Poznan after having cheered over the line the last finisher.” Foto: Anette Gersbeck. 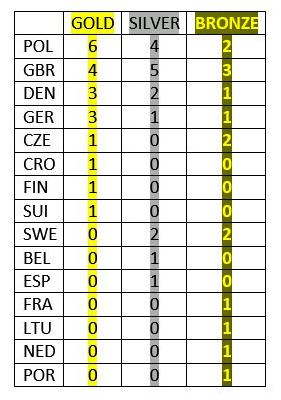 So, after all the medals had been presented, how did the medal tables look? As expected, Team GB was up there but their final medal haul was only good enough for second place in the rankings. 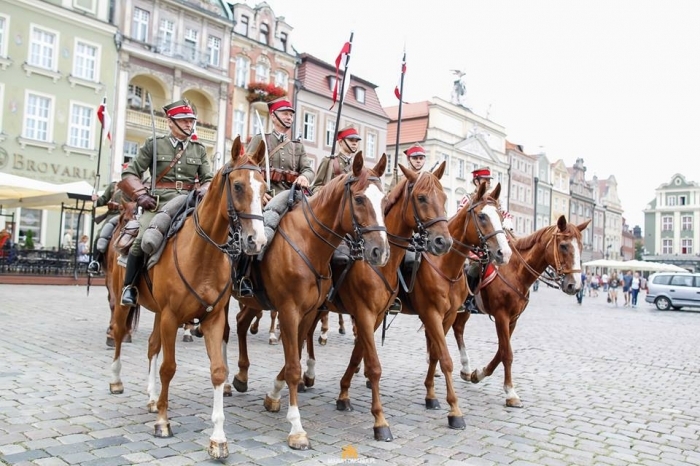 It was the host nation, Poland that took top ranking with 6 gold medals. A long day at the office for all but what a spectacular event in such a delightful location. The full results for each category are here. 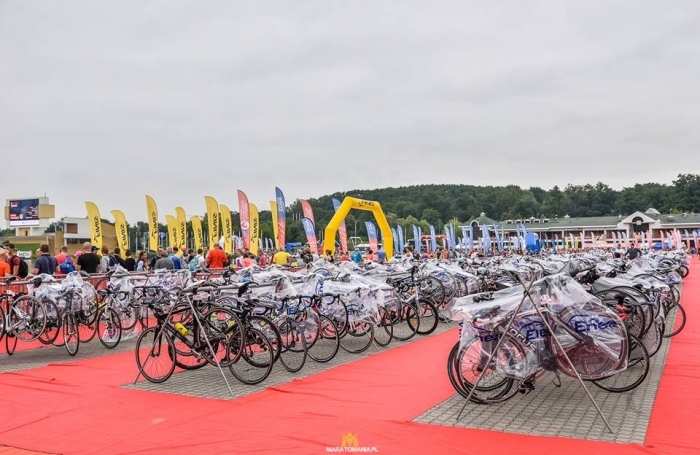 Over in Rotterdam, the venue for the 2017 ITU World Championships, the Elite were presented with a highly technical bike course that had 26 turns in each lap. 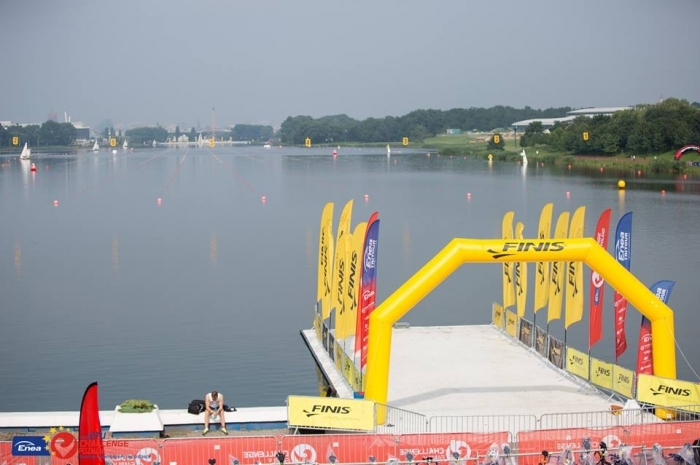 The swim started in the warm and sheltered waters of the Nieuwe Maas. 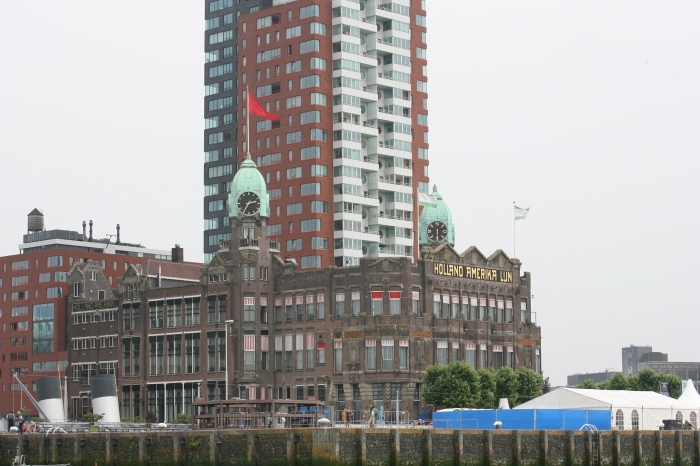 A short section of biking over the impressive Erasmus Bridge using established cycle paths led them to a compact twisting and turning ride in downtown Rotterdam that gave the athletes a total of 78 turns during their 20k ride. 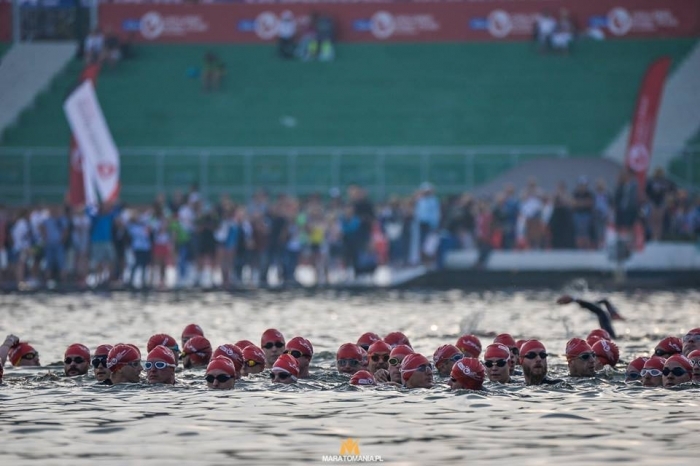 The event would be a fine test for 2017 and the crowds were out in force to see the athletes racing. The atmosphere before the start was tense for some. 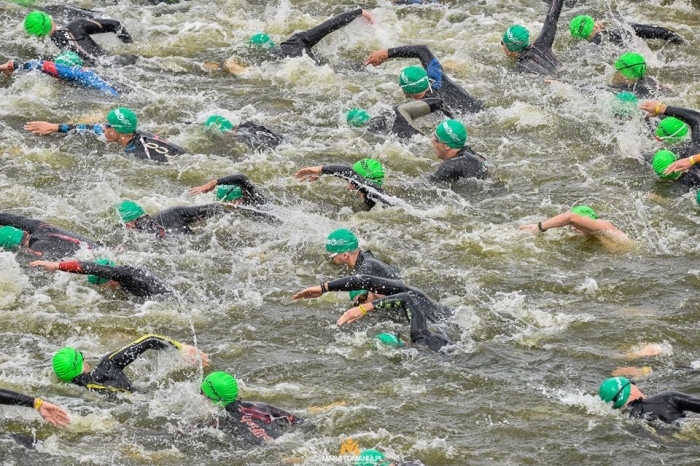 It was the women who set off first and with the water at 24C no wetsuits were permitted. An eager swimmer was clearly identified as she anticipated the start signal but as there were also a couple of others who jumped the start who could not be readily identified the race referee sensibly decided that rather than penalising only the obvious early-starter and leaving the others un-checked, no penalty would be issued at all. A good call. 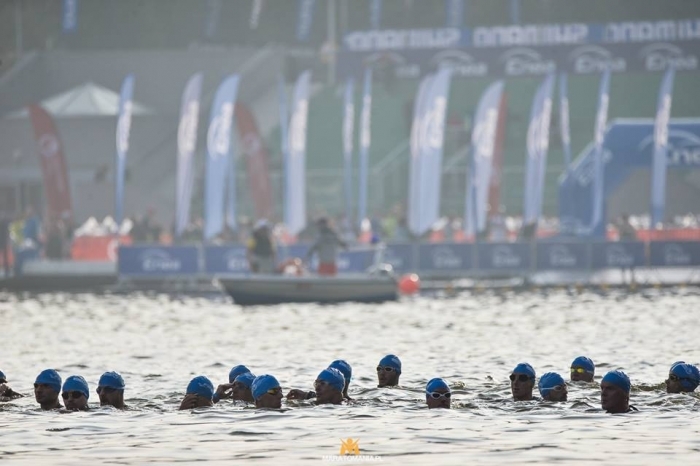 The early swim lead saw a breakaway of three athletes, led by Vittoria Lopes BRA. 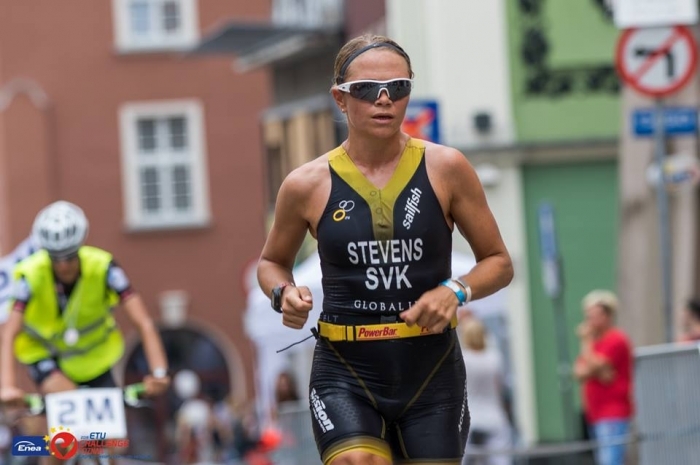 She was joined by race favourite Kirsten Kasper USA who was part of the victorious US mixed relay team that took gold in Hamburg the weekend before. They were joined by New-Zealand born Aussie, Tamsyn Moana-Veale. They held their lead but were ultimately caught by the hard cycling and determination of the chase pack. To the delight of the local crowds Kirsten Nuyes NLD was amongst that group. 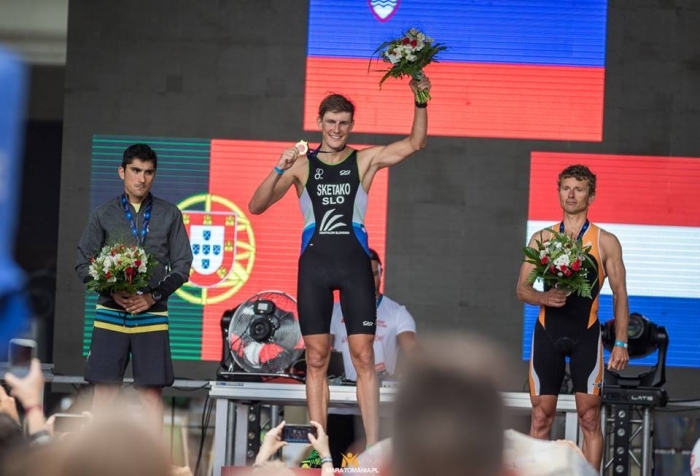 Still racing as a junior she was, on home soil, having the race of her life and against much more experienced athletes, some of whom had already secured their ticket for Rio. 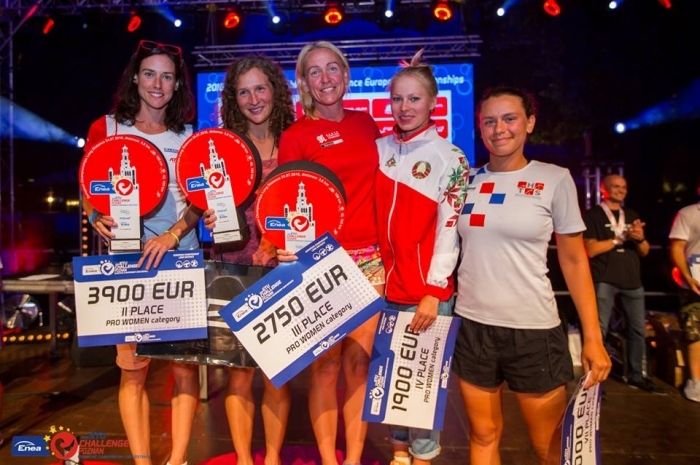 Tucked in that group were Georgia Taylor-Brown GBR, Sophie Hooghe and Claire Michel BEL and another Aussie, Sophie Malowiecki. The eight athletes worked hard around the course and built up a lead that might just be enough to get them clear on the final 5k. Entering T2 their lead had been significantly reduced by the determined riding of two British athletes. Zoe Thomas and Fenella Langridge had worked hard. So hard in fact that Thomas lost her wheel on one bend, slid over some grass shipped her chain, fixed that, got back on and caught up her team-mate and then carried on working to bridge the gap. 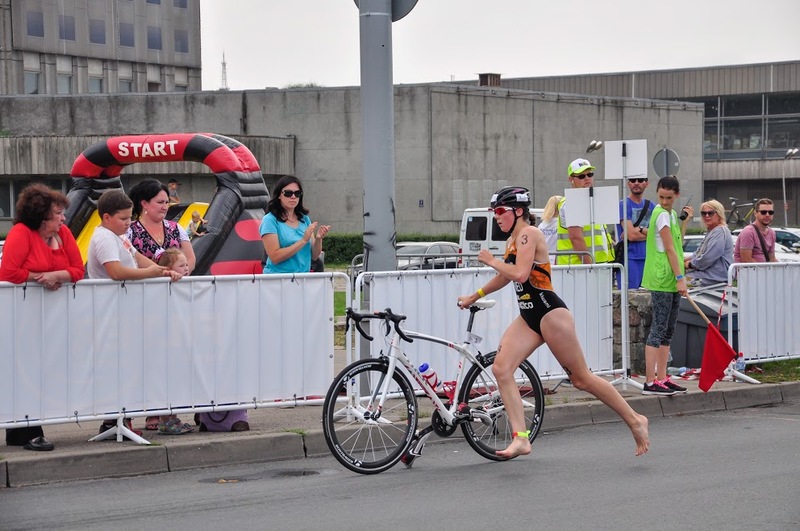 Thomas has shown great power out on the bike already this year when she bridged a two-minute gap in Burgas. 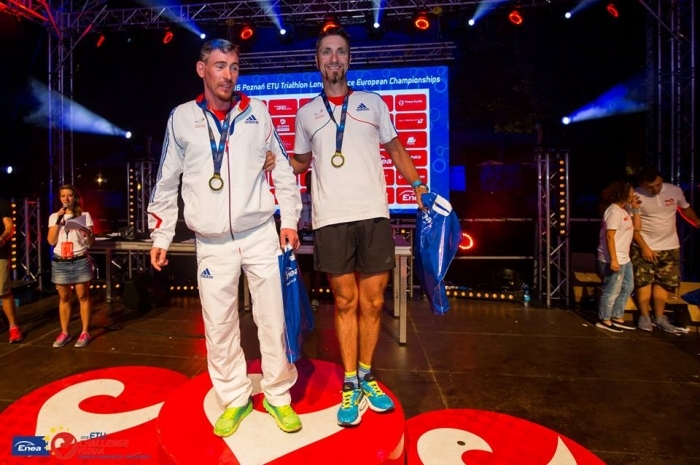 When we thought the medals would be shared by the leading 8, these two Brits had suddenly offered a wider race. Kasper led Nuyes out onto the two-lap run. 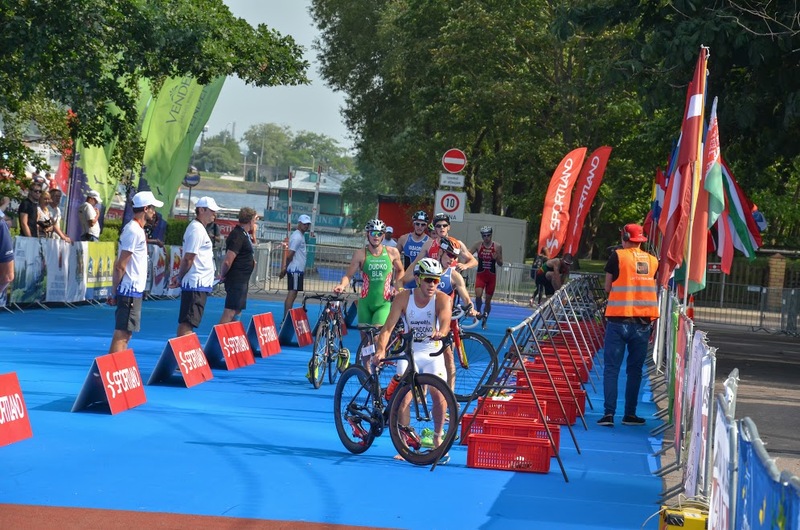 Italy’s Sara Dossena returning to form after a lengthy lay-off due to injury, was ready to chase faster and she exploded out of T2. Sadly for her a ten-second time penalty awaited her on the run course. 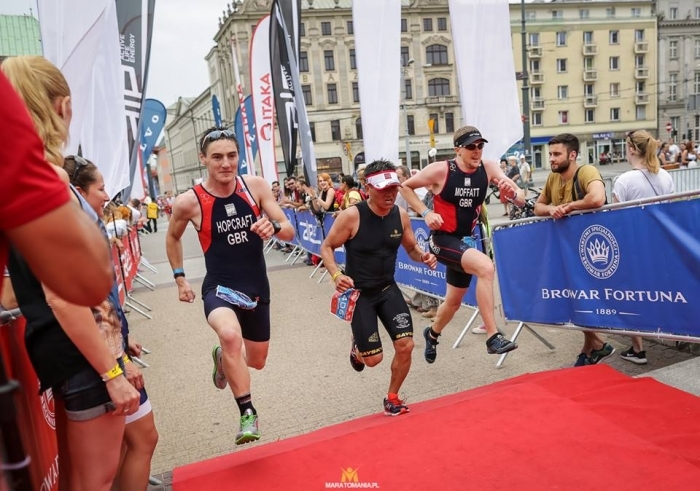 As the first lap was finished Kasper was still leading but the timing chips showed that Michel was lapping 3 seconds faster and had the American in her sights. As she sped around the course it was only a matter of time. Sure enough she overtook Kasper and nearing the blue carpet injected more pace to the cheering delight of the crowds. Gold to Claire Michel and what a gold this is with Rio so close. 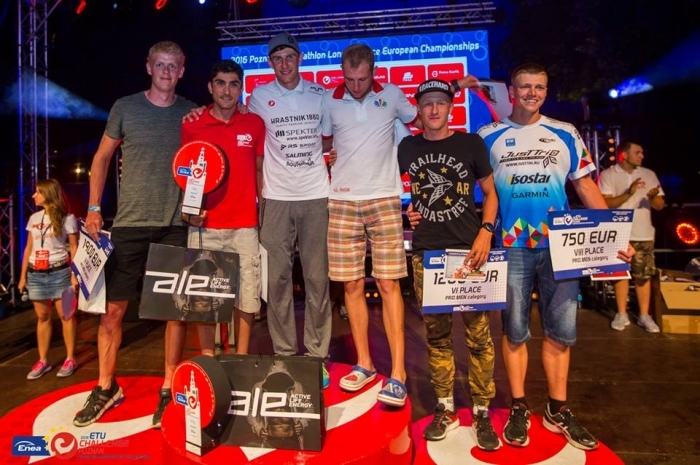 Silver went to Kasper and bronze was taken by Malowiecki. Dossena, despite her ten-second penalty, came 4th. 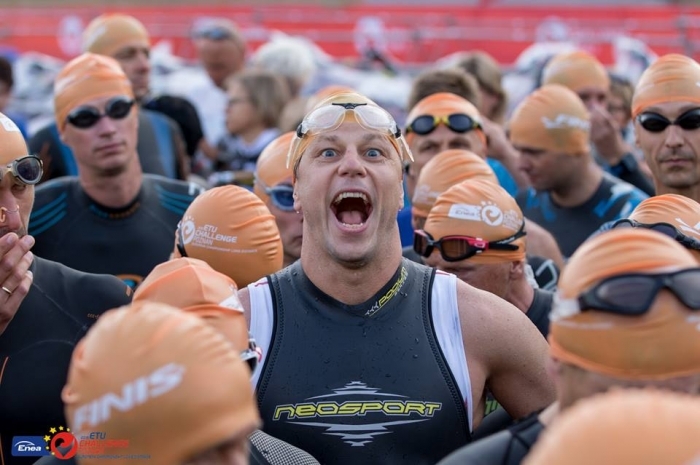 “Too bad for the podium but I can consider myself satisfied!!! ... we start again from here!!!! 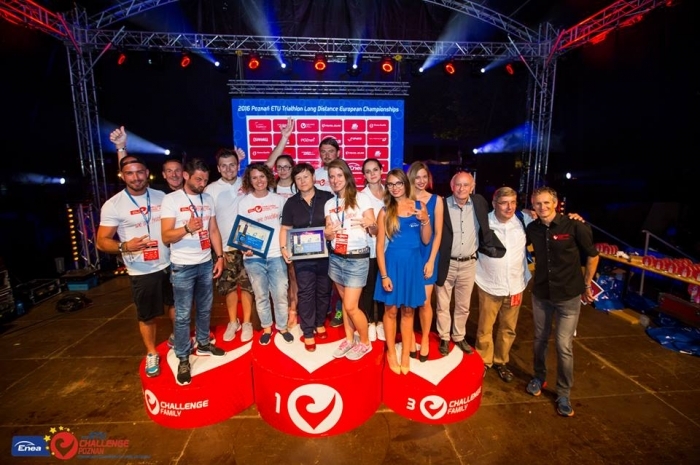 peccato per il podio ma posso ritenermi soddisfatta!!! ... si ricomincia da qui!!!! » Watch out everyone. She is back! For the men there would be crashes and sadly that robbed us of some of the sprinters. 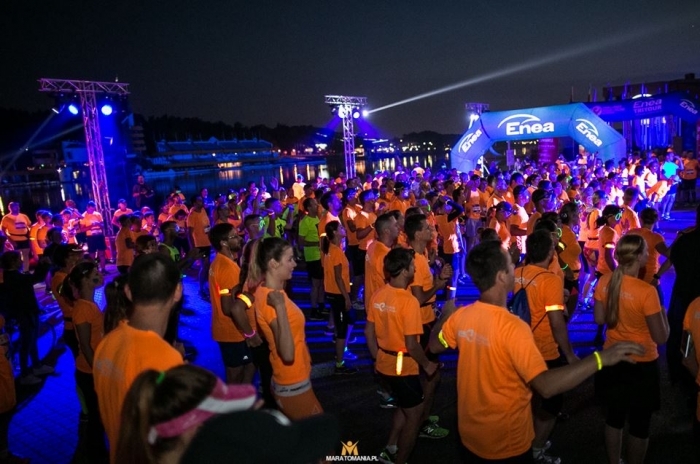 As the large group of athletes made their way over the bridge five of them crashed before the end of the first 3k. 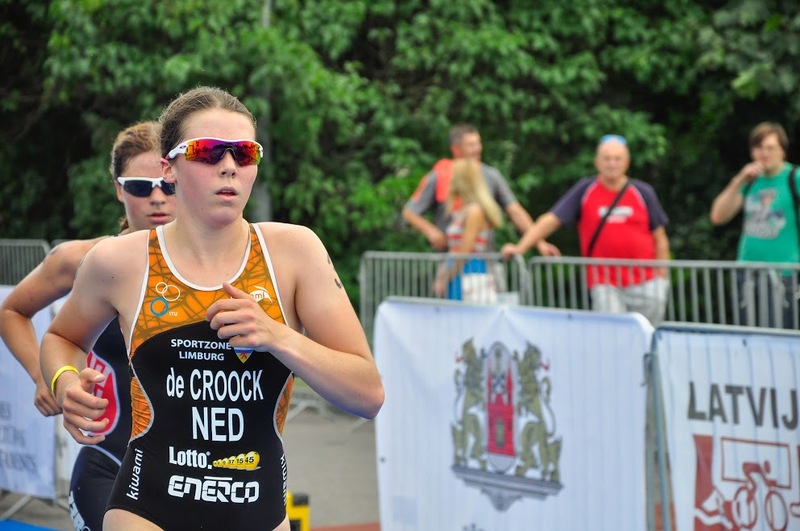 Once out onto the laps, one of the Dutch athletes skidded and crashed into the barriers. Adrien Briffod SUI could not avoid him and to his utter dismay, his race was over as the second crash in two weeks robbed him. 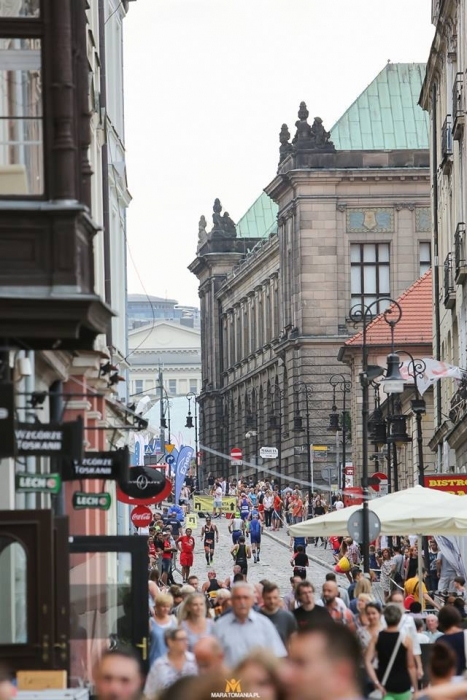 With some 10,000 spectators lining the streets the atmosphere around the tight downtown course was amazing. 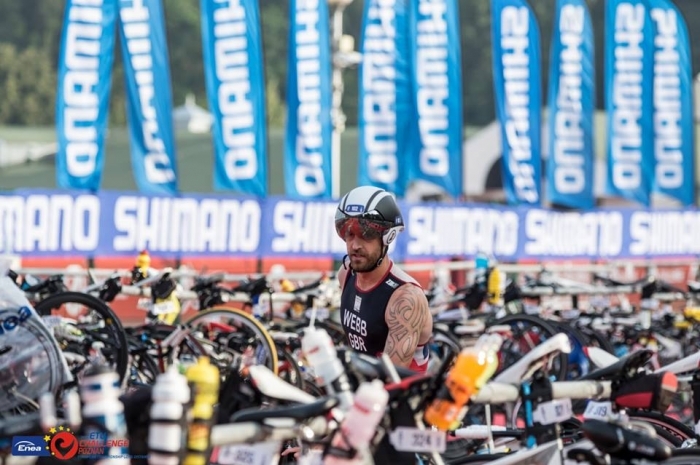 Many of the 1,300 athletes who raced the morning’s open event and Dutch Championships, stayed on to enjoy the sunshine and to watch the elite. 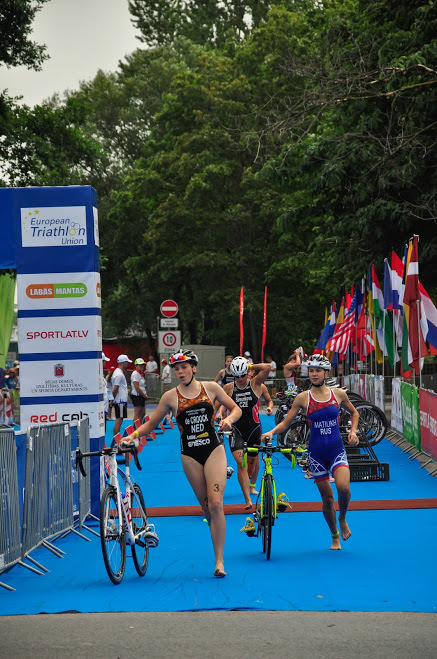 As the lead pack came into T2 the crowds went wild with excitement as the three Dutch athletes were there, leading. 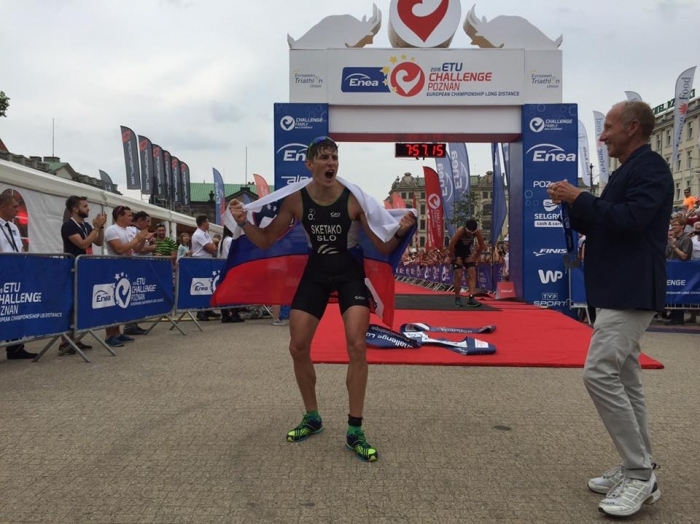 Jorik Van Egdom, Marco Akershoek and Marco Van Der Stel had survived the intense pace out on the bike and had put the Dutch team into a potential clean sweep position for the podium. 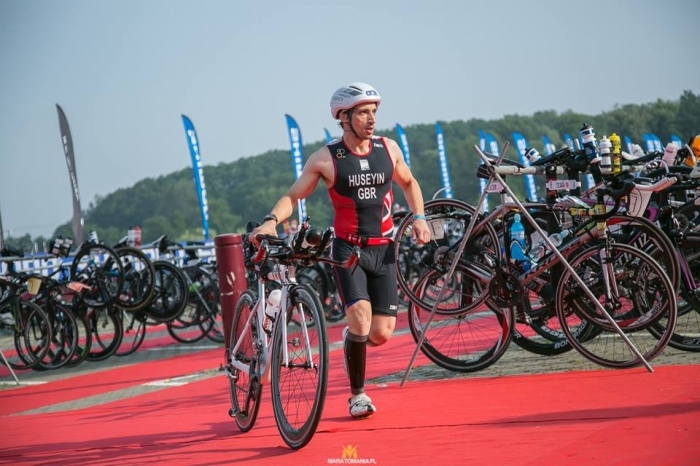 They were joined by Jimmy Kershaw GBR, who was having the best race of his life having moved up from the junior ranks where he held silver in the 2015 ETU Duathlon Championships as a Junior. This would mean that he was a potential threat to the Dutch with his proven running off the bike. Also there and from Australia, was Kenji Nener. The race was on. Five athletes and three medals. 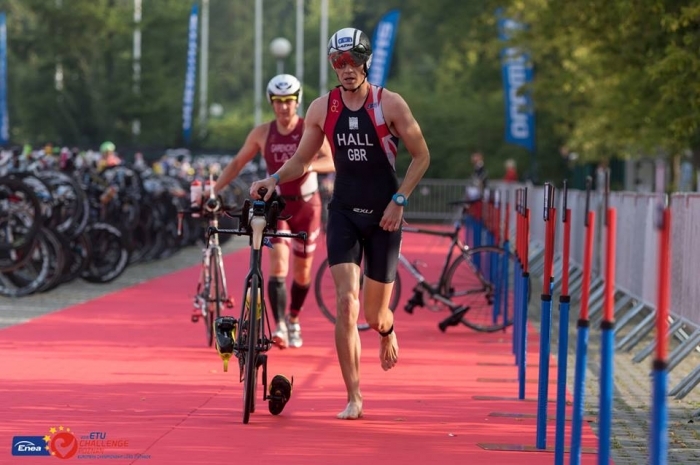 Van Der Stel flew out of transition with Kershaw and Van Egdom close behind. 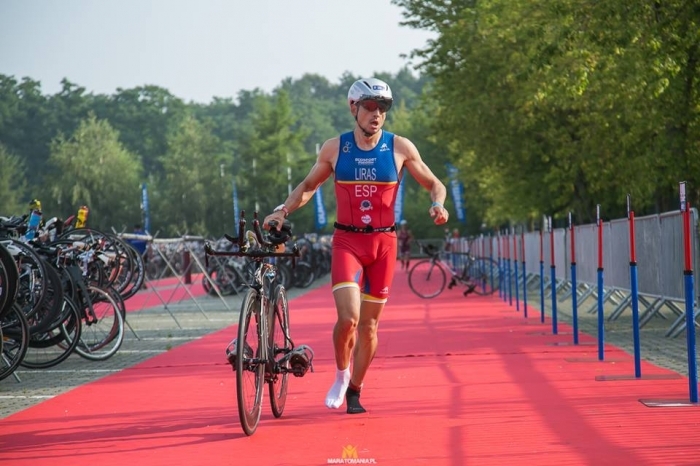 We have seen the pure determination of the ETU U23 and Elite Duathlon Champion Van Egdom and have seen him dominate on the run / bike / run format. 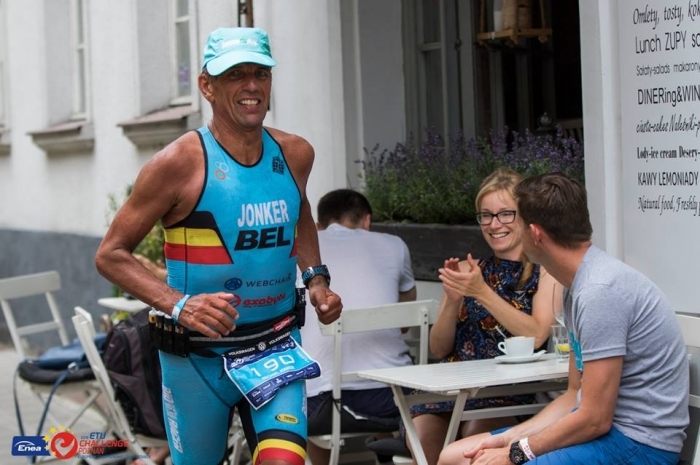 We have seen him turn a bad swim into a remarkable bike and run but here, on the streets of Rotterdam and with the crowds urging him on he took control, pulled away and showed a clean pair of heels to the rest of the field. Behind him came the race for silver and that was won, loudly, by Kershaw. Still buzzing after the race he explained that this was his best race ever! 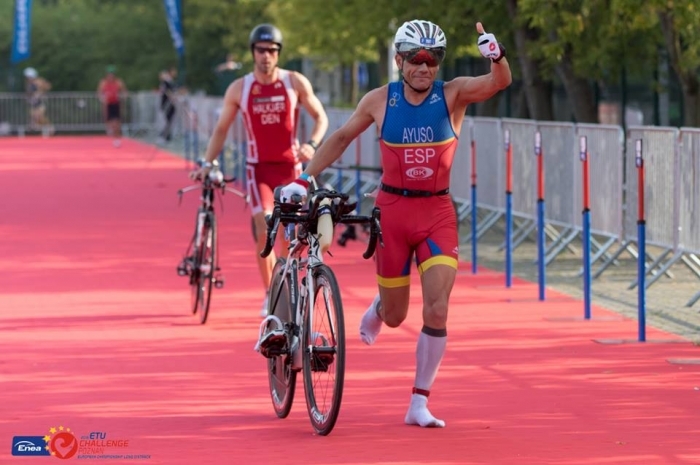 Bronze went to the Spaniard, Francesc Godoy. 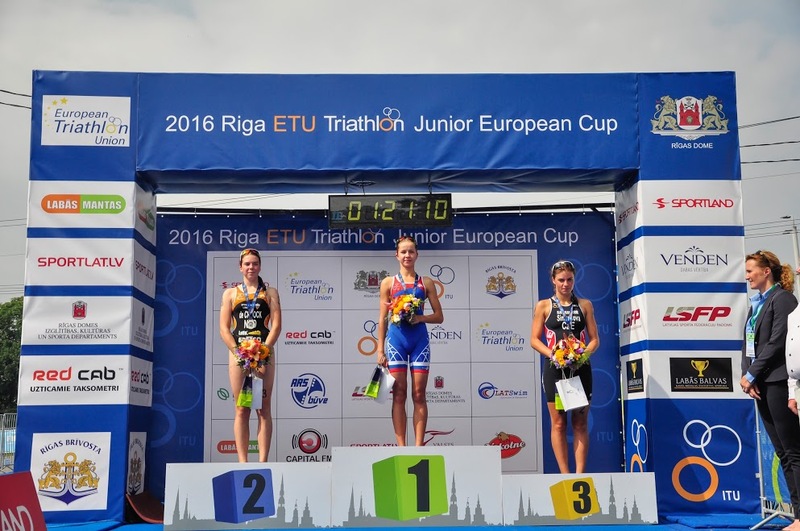 The results from this race will soon be visible in the ETU Rankings. 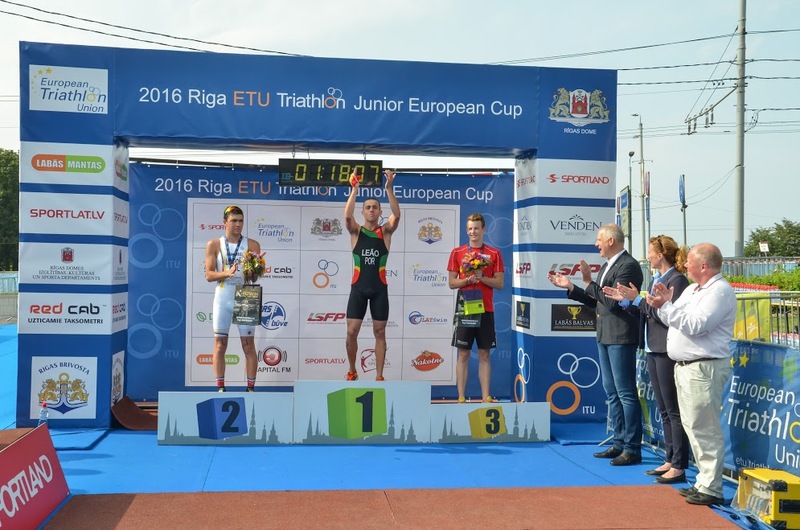 Our last review today covers the Junior European Cup in Riga. 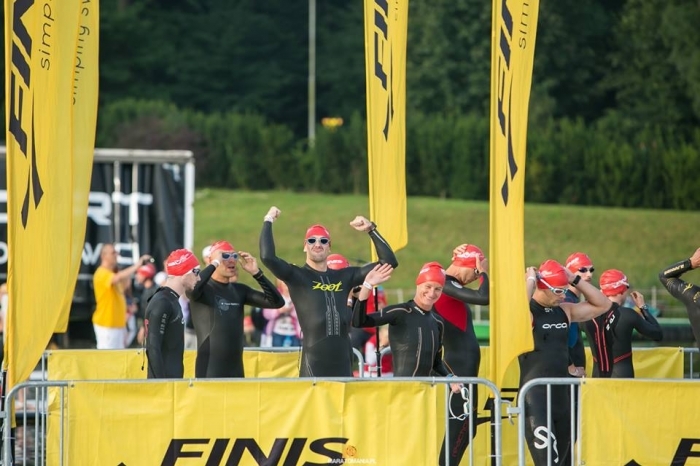 Once again the Federation and LOC offered races for all on this busy weekend and using the one venue, our sport was open to many categories. 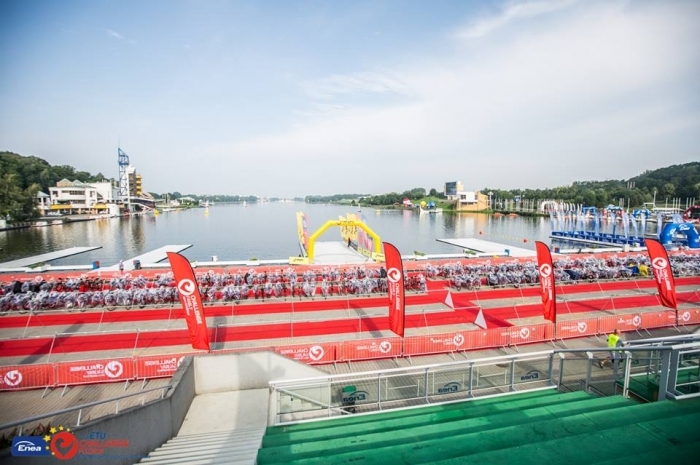 Race day opened with events for kids, junior and amateur athletes in different age-groups. 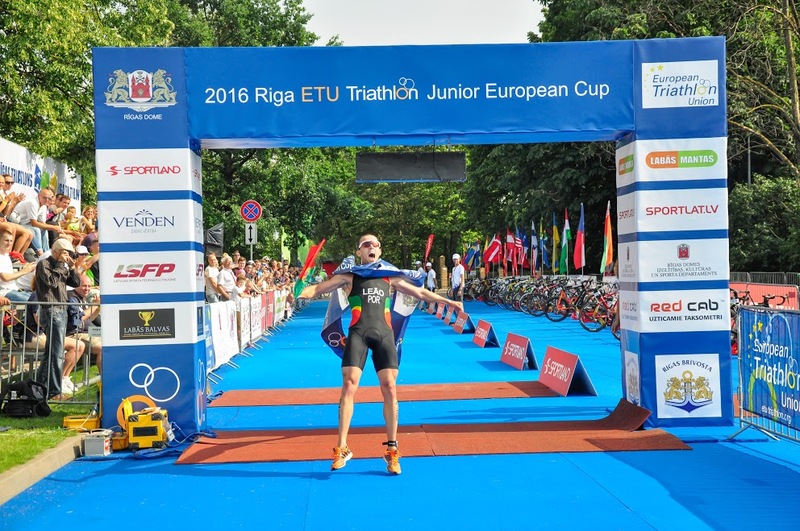 The distances covered were designed to open the sport up to as many people as possible and so to further develop triathlon in not only Latvia but also in the Baltic States. Participants came from Latvia of course but also from USA, Lithuania, Estonia, Russia, Spain, France, Denmark, Ukraine and Belarus. 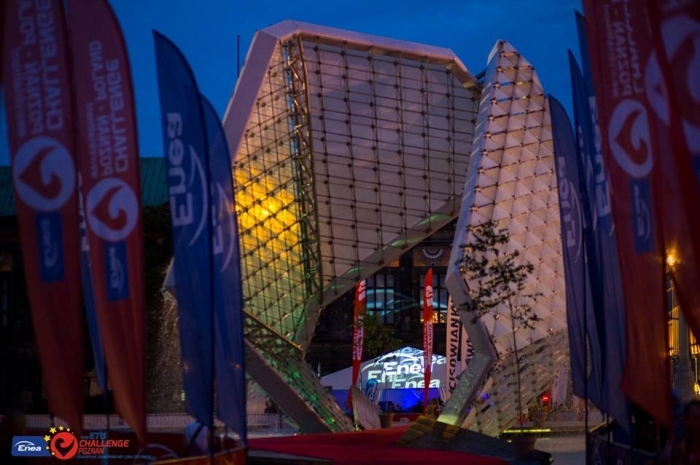 The whole event is situated in the centre of the Riga next to the Swedbank main building “Sun Stone”. 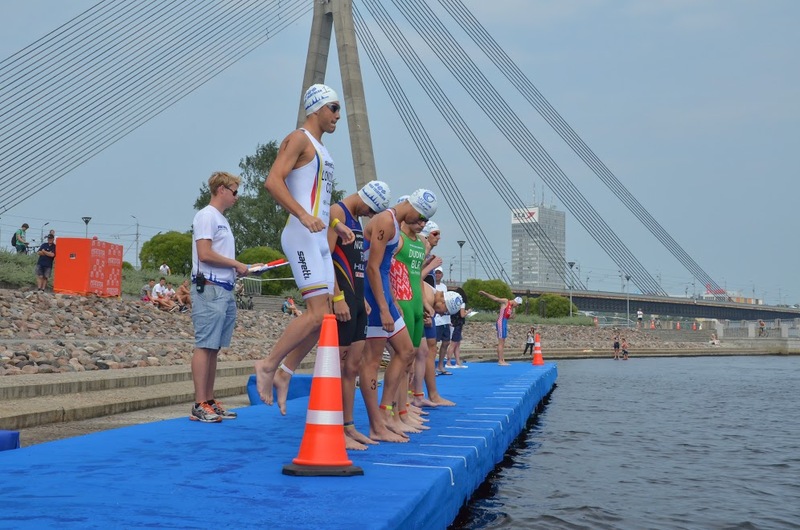 The fourth edition of this race was given over to the Junior athletes. 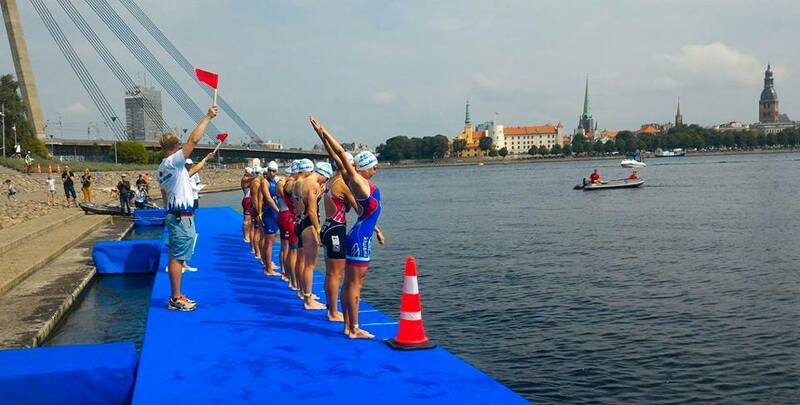 It was their chance to showcase and having taken on board the advice from the ETU Technical Delegate over the LOC has revised and reviewed the event from previous years and the most impressive improvement we can see is the construction of a start pontoon that enables the athletes a dive start into deeper water. 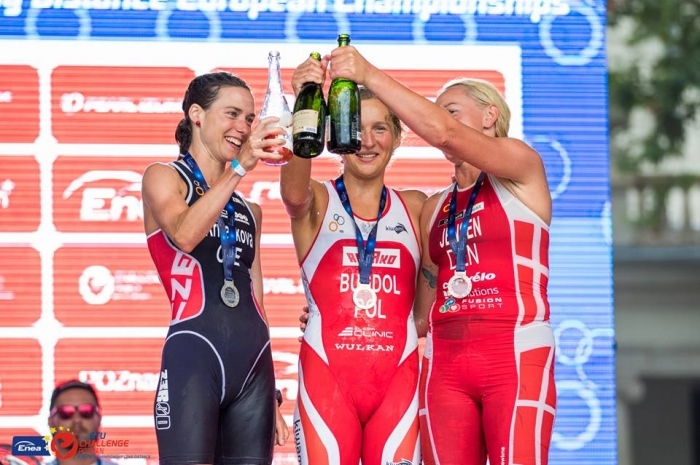 For the women, race favourite was Russia’s Ekaterina Matiukh. The water was a wonderful 22.4C, so no wetsuits were allowed. 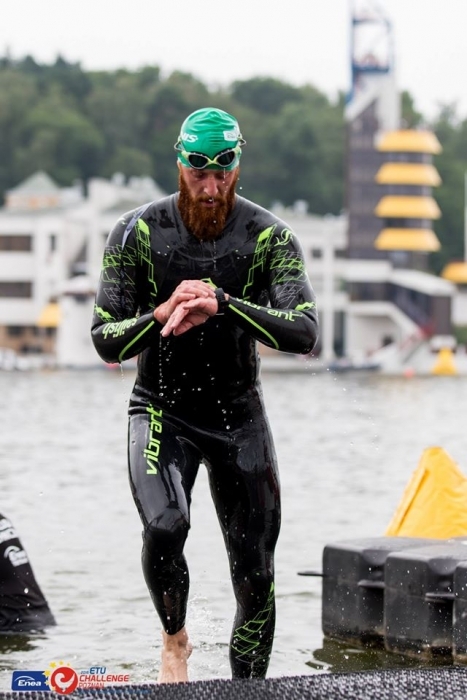 This would make the swim much more important as it would allow the stronger swimmers to take advantage of their techniques and if possible, to leave behind those who relied upon the extra buoyancy that the wetsuit allows. 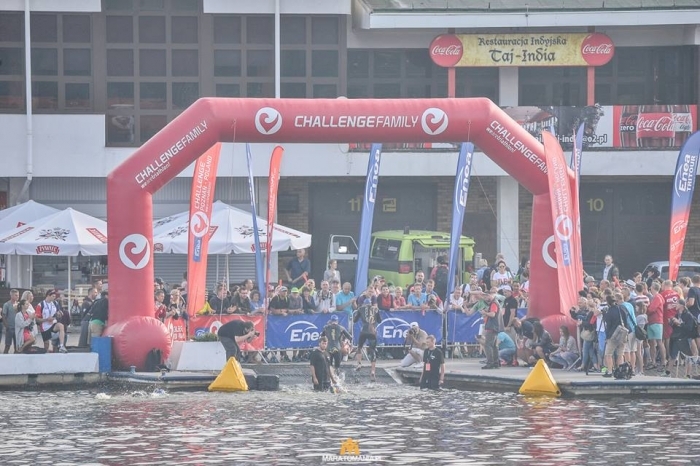 The swim certainly favoured Rianne De Croock NLD and it was she who led from the water having established dominance in the swim from the start. Behind her came the race favourite, Matiukh and, from Estonia, Anette Hallik. Then came the Czech athlete, Simona Šimůnková. Matiukh was first out just behind De Croock as they left T1 and quickly worked on the pedals to break away from the chasing athletes. De Crook’s foot just would not go into her cycle shoe and she lost the initial impetus. This allowed Matiukh to make good her escape and she set off for a lonely 20k with nobody near her. 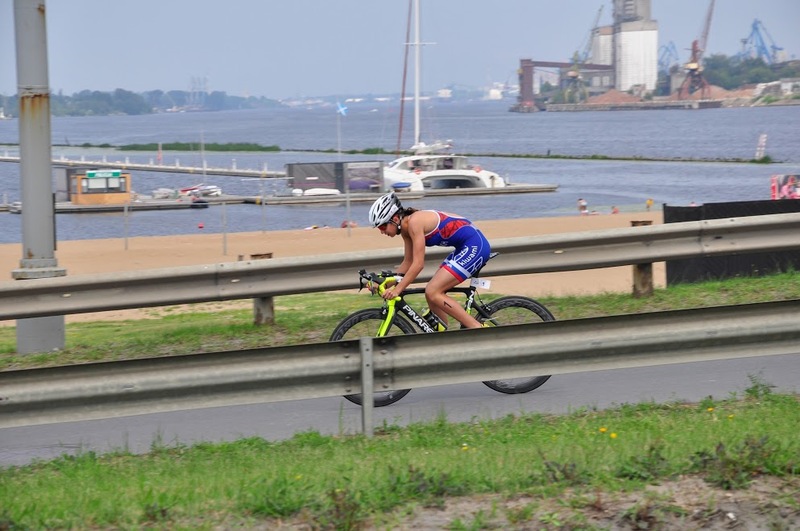 The chase group of the three made little impression on the leading Russian and after about half the course had been completed it was De Croock who decided enough was enough and she broke away to chase down Matiukh. The gap had not been bridged but it gave her the advantage over the other two and she entered T2 on her own but closer to the Russian. De Croock was chasing the Russian. 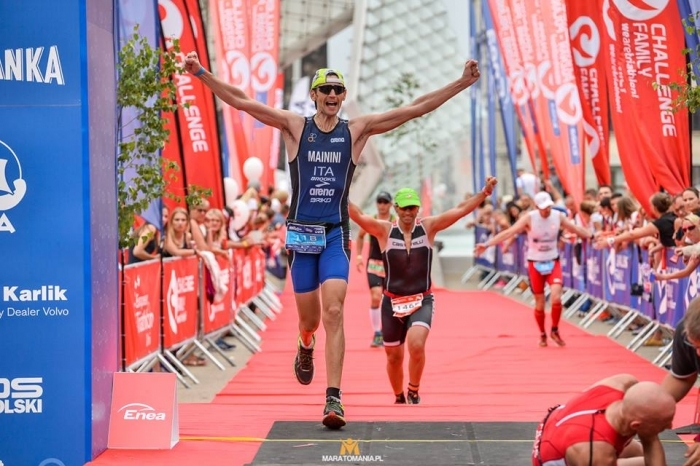 Once out on the run course Matiukh was unbeatable. Her run spilt of 17:45 was never going to be matched and she crossed the line to take gold with over 4 minutes advantage. 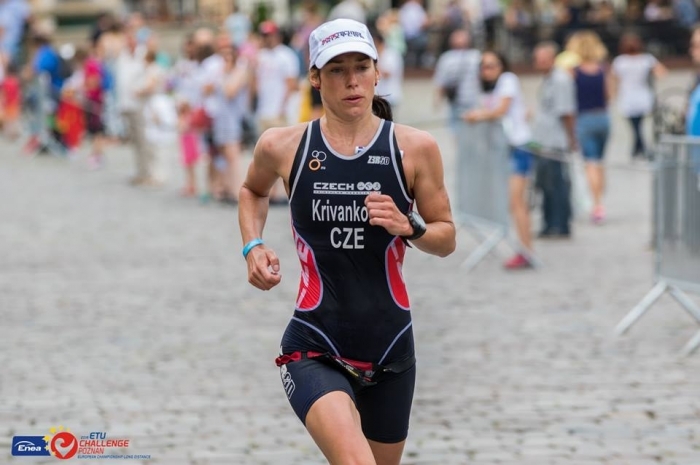 Behind her De Croock was trying to hold her lead but behind her the faster Czech, Šimůnková was gaining. Suddenly they were neck and neck, then the Czech was ahead. 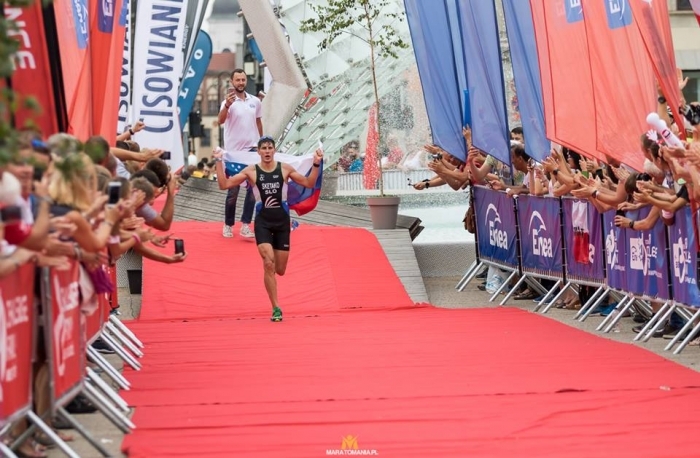 De Croock dug deep and from somewhere found enough to pull up to, alongside and then to pass Šimůnková and as they neared the finish it was De Croock who had just enough left to hold on to the silver position with bronze going to Šimůnková. For Latvia, their best-placed athlete, Daniela Leitāne, just missed out on the medals with a 4th place. 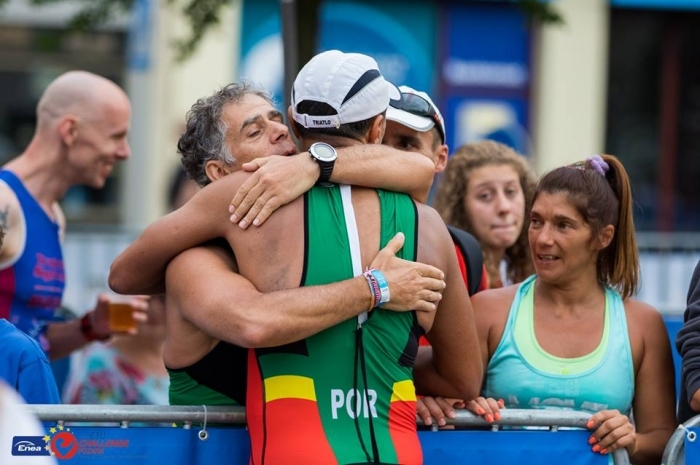 For the men, it was the visiting Colombian, Eduardo Londoño Naranjo who led the swim. 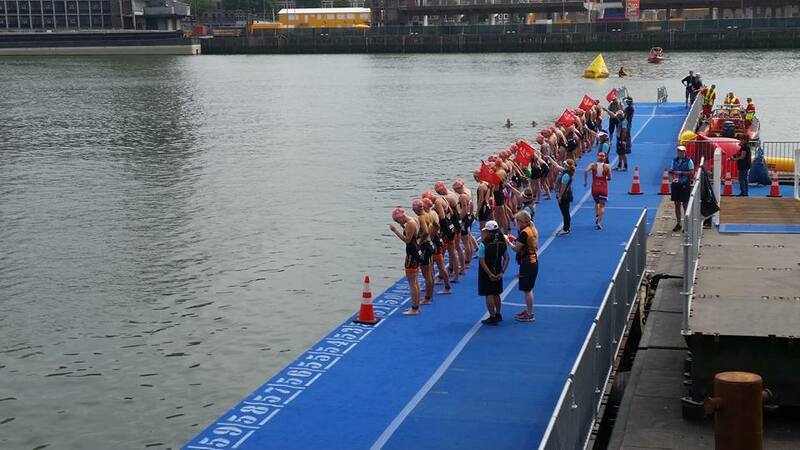 A steady stream of 17 athletes filed out of the water and into T1. 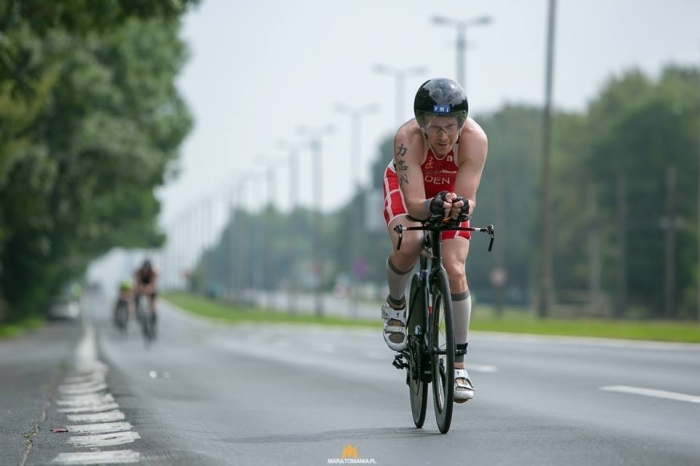 As the bike course unfolded there were a few who dropped off due to the pace and when the men returned to transition the group was down to 7. Tiago Leão POR had ridden well but was by no means in a winning position because still in that leading group was the Colombian. 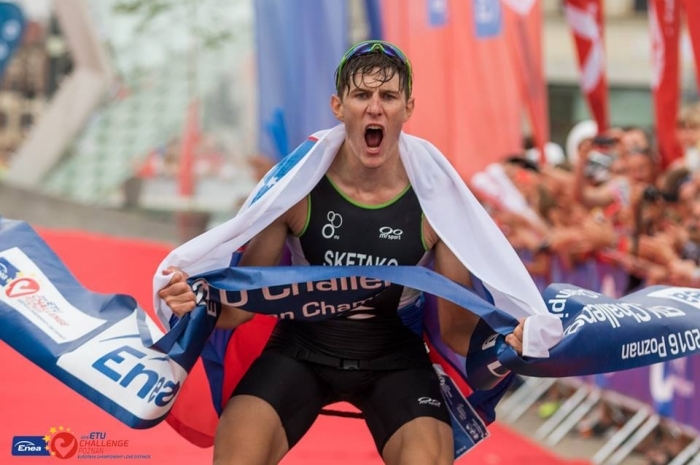 He was followed by Denis Dudko BLR, Henry Räppo EST, Lukas Gstaltner AUT, Kevin Vabaorg EST and Savelijs Suharževskis LAT. 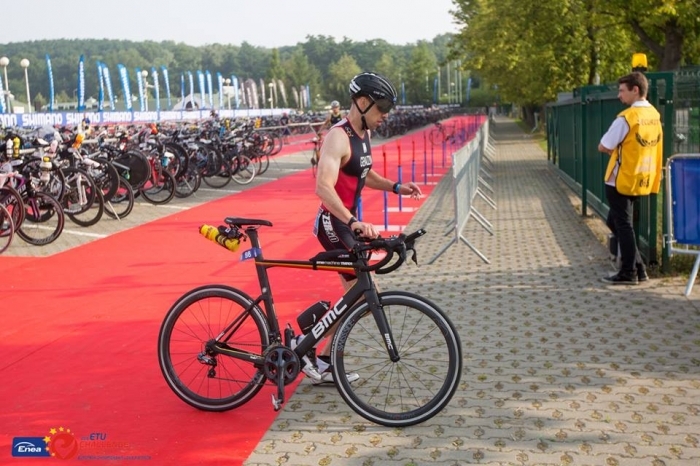 Leão racked his bike ahead of the others and led them out onto the run. 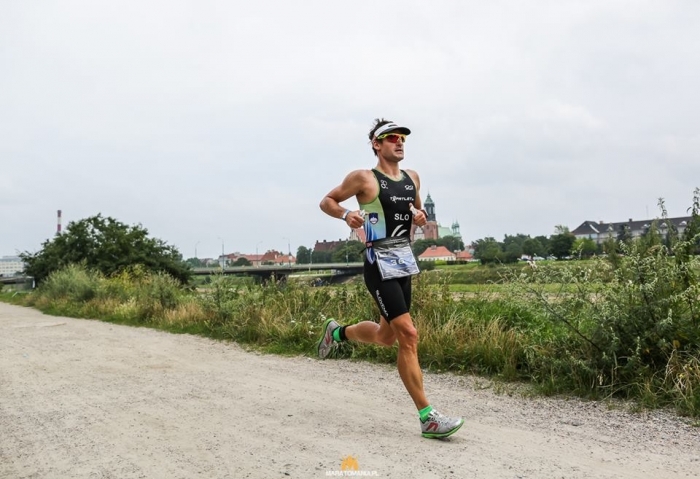 His pace was no match for anyone else and he established a lead that would not be beaten. Gold went to Portugal with silver going to the Colombian. 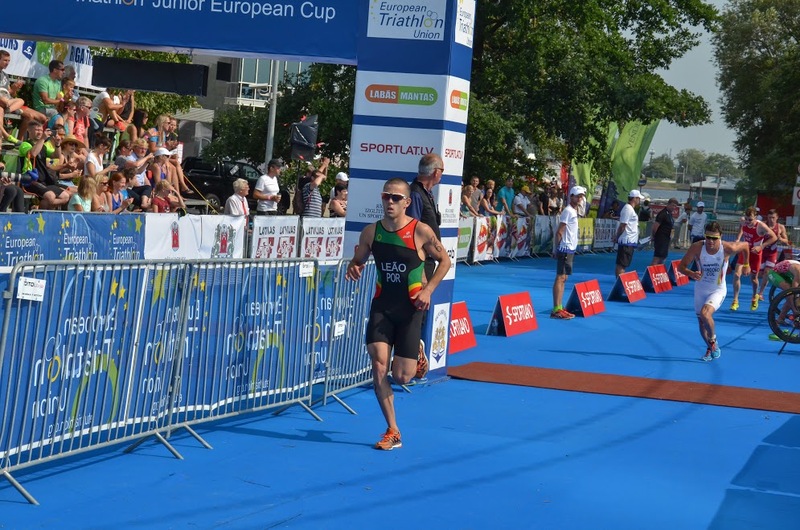 It was Austria’s Gstaltner who took bronze to finish the podium and to win his first ever ETU medal. Gemeinsam mit meinem Papa machte ich mich bereits am Freitag nach Riga auf. Nach dem üblichen Europacup-Prozedere (Familarization und Briefing) und ein wenig Sightseeing war es am Sonntag Nachmittag dann endlich so weit. Erstmals hatte ich auch mit Nummer 8 eine ziemlich niedrige Startnummer, wodurch ich mich am Start gleich in der Nähe der Favoriten platzieren konnte. 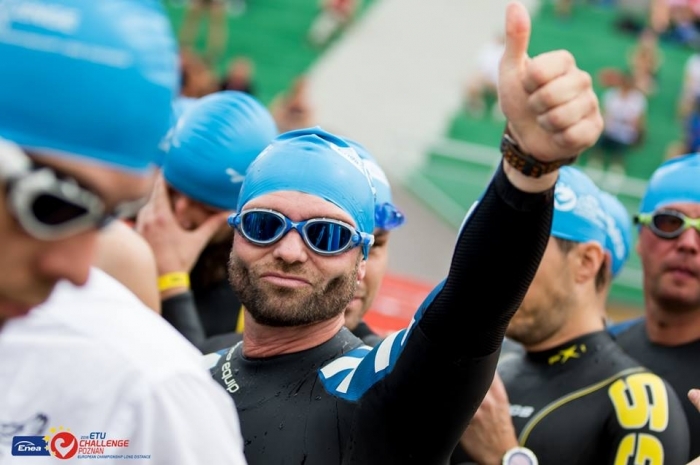 Beim Schwimmen konnte ich mich diesmal aus den gröbsten Schlägereien heraushalten und auch ohne Neo eine solide Schwimmleistung abrufen. So ging’s als 6. aus dem Wasser, nur wenige Sekunden hinter der Spitze. 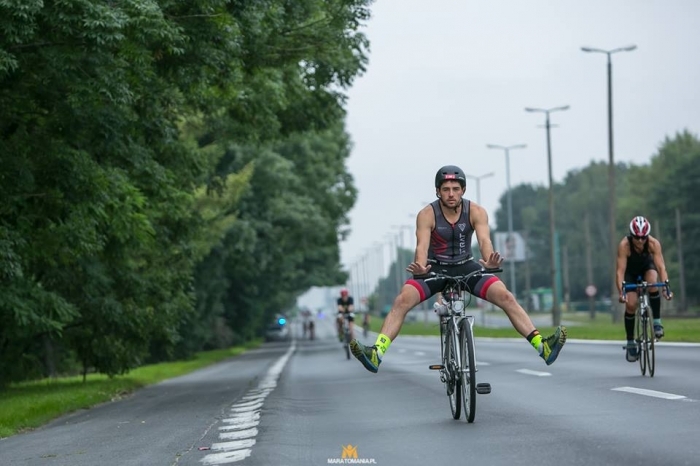 Nach einem guten ersten Wechsel war ich bereits 4. am Rad und schaffte nach einem harten ersten Kilometer den Sprung in die Spitzengruppe. Da wir uns in der Radgruppe nie einig waren, folgte eine Attacke auf die nächste. 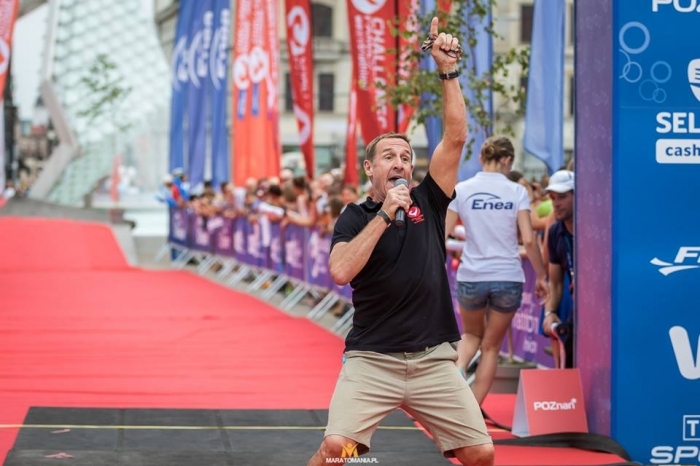 Dabei versuchte ich, anders als vor zwei Wochen in Ungarn, mehr Kraft am Rad für den abschließenden Lauf zu sparen. Mit einem schnellen zweiten Wechsel kam ich in einer guten Position auf die Laufstrecke. Ich versuchte am Anfang meinen eigenen Rhythmus zu finden, in der Hoffnung am Ende davon zu profitieren. Und so geschah es dann auch. Bereits am Ende der ersten von zwei Laufrunden merkte ich, wie ich dem drittplatzierten Esten wieder immer näher kam. Ich versuchte sofort seine Schwäche auszunützen, ging an ihm vorbei und konnte ziemlich rasch den 3. Platz souverän absichern. Dank meines starken 3. Platzes durfte ich auch erstmal die Award-Ceremony am Podest genießen. 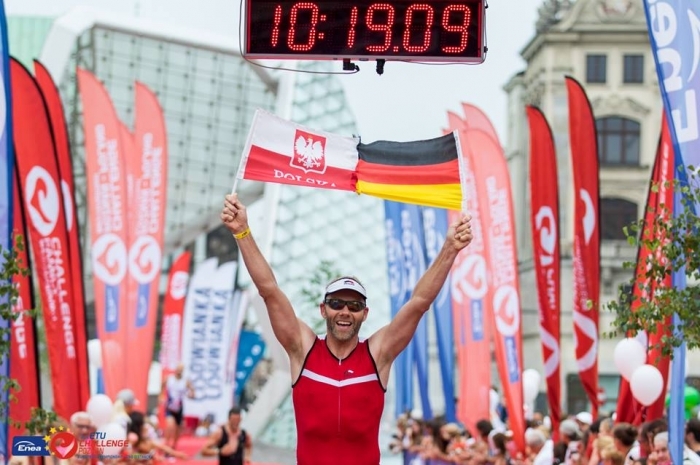 Richtig cool dort oben zu stehen, vor allem wenn man dann auch noch die ETU-Medaille überreicht bekommt! So kann’s weiter gehen! 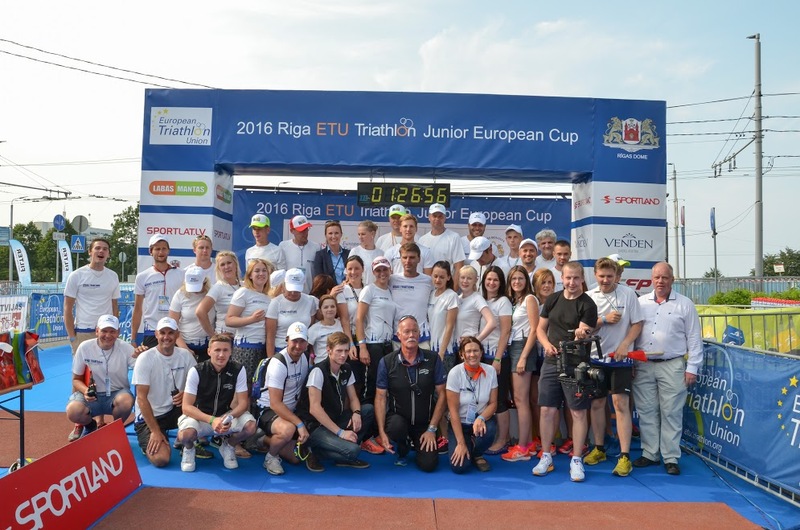 Next stop: Junioren-Europacup in Tabor/CZE bereits nächstes Wochenende. For a massive gallery of images from the LOC, please click here. So a huge success once more. 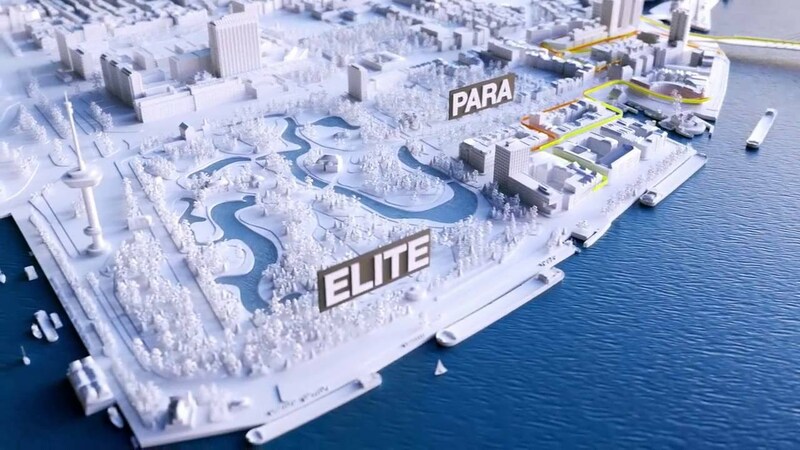 Riga continues to grow and continues to deliver. 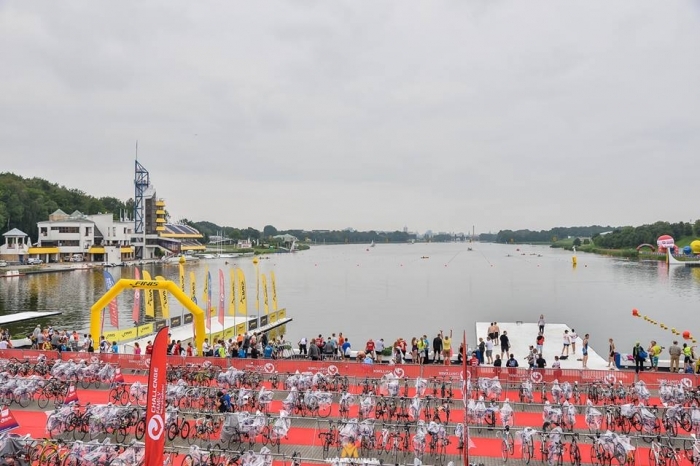 Make a note in your diaries to race here next year!